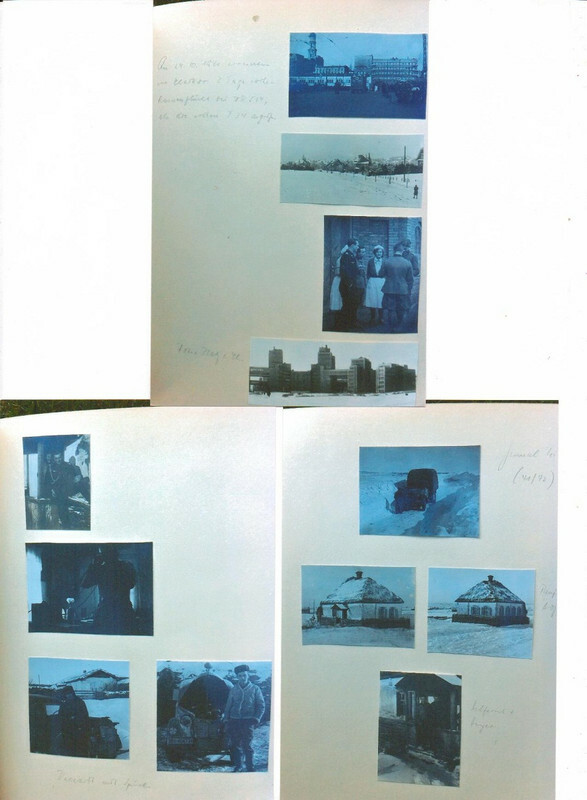 The life of RKT Major Hans Guhr. 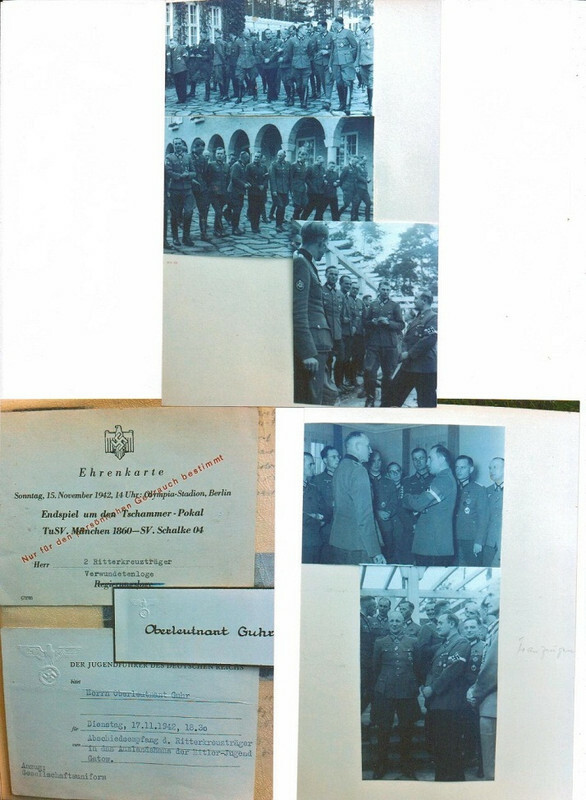 The story of Major Hans Guhr has a special meaning for Germany’s history, regarding a life’s tale that covers two very important events surrounding the people of Europe: World War II and the consequent structuration of Europe. 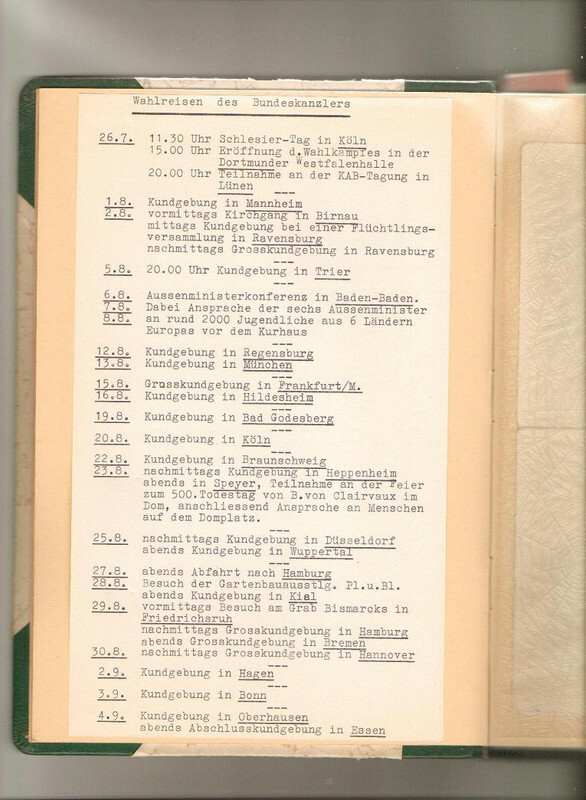 In this case, Major Guhr witnesses the tragic timeline of the Eastern Front, as a dedicated soldier, commander and fellow comrade of many brave soldiers who died for their country; but also as a civilian devoted to help the first German Chancellor after WWII, Dr. Konrad Adenauer, during his difficult task of rebuilding the spirit and life of Western Germany. Mr. Guhr worked as the speaker of the so called Amt Blank, later the Minister of Defence, restarting his military career in the Bundeswehr as a member of the PANDA Division in SHAPE (France), reaching the rank of Oberstleutnant im Generalstab and retiring later to become a journalist as a civilian. 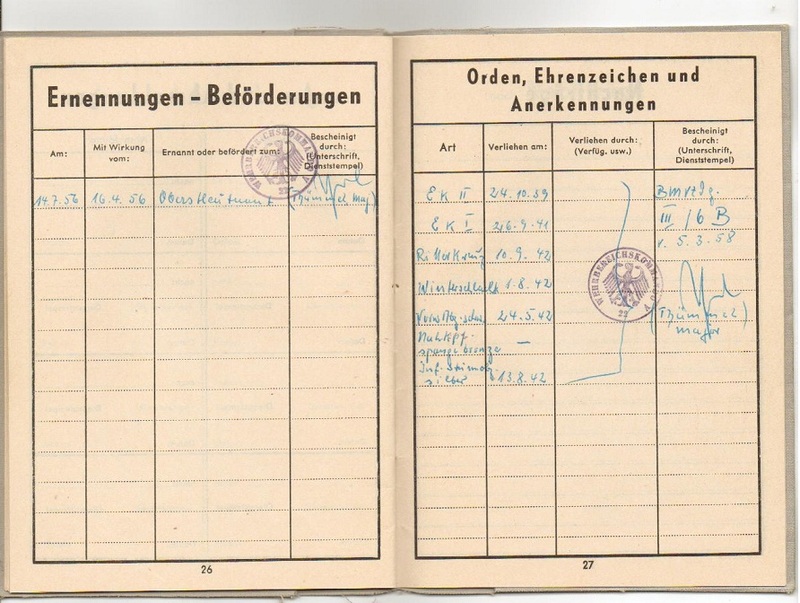 In this simple, but trustful paperwork, I intend (with the help of Michael Guhr) to bring some light to the life of this German soldier, a Ritterkreuzträger of the Wehrmacht, witch reflex the bravery of fighting two battlefronts in his life, separated by the hard times of each and the success of every “mission” he accomplished, always giving his best commitment. Hans Guhr was born October the 24th, 1916 in Dresden, Germany. 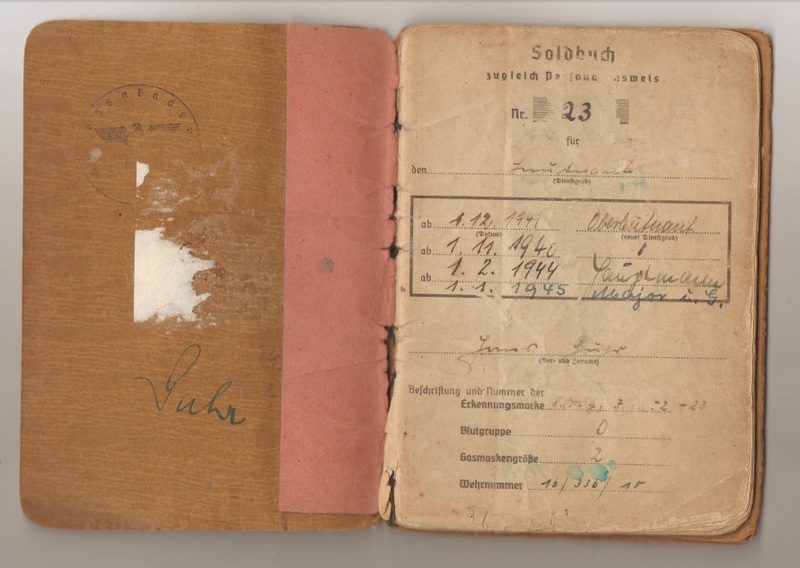 Like many young Germans, trying to live with his family through the hard times of the post war and the devastating effects of it in the day to day experience, where economy didn’t give much for families. He was an only child, whose father had fought in WWI and survived. 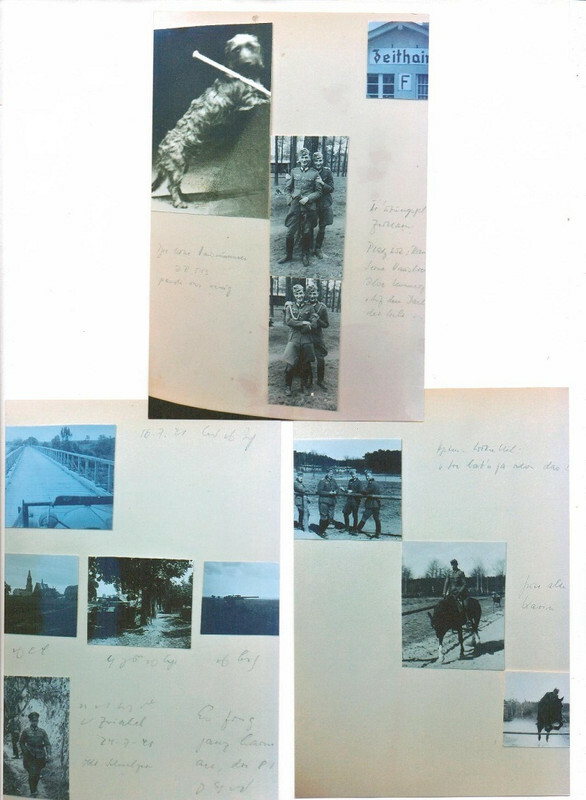 In his early years, he was very fund of outdoors activities (completing a bicycle tour in 1934, from Dresden to Sylt), and showing great interest in the army life and horse riding. 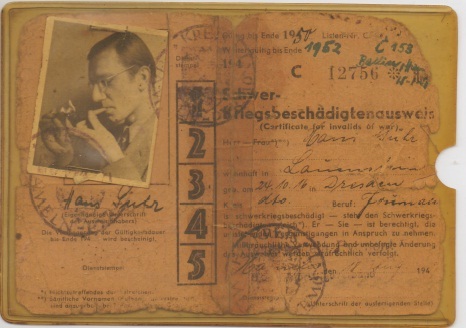 The DLRG card of Hans Guhr, during his youth as a boy in Dresden. 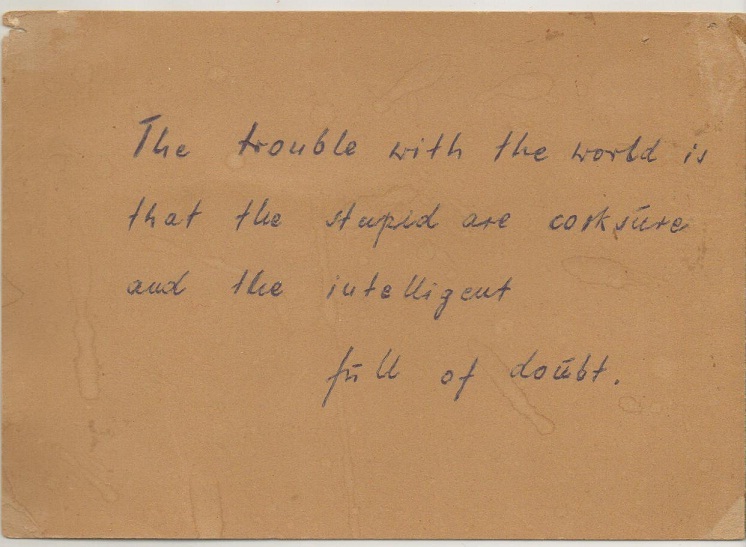 Backside of the same card. During his Highschool years, he was asked to write down his interests as a future adult. 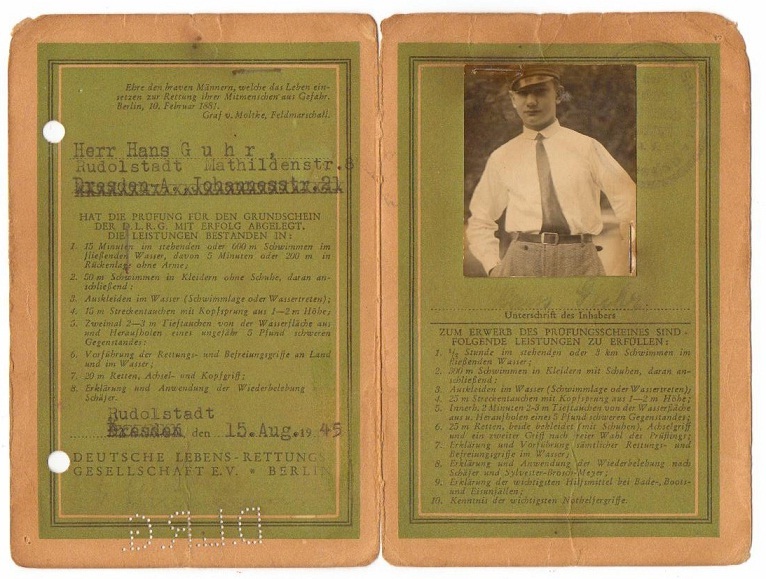 Here's Hans school card, regarding what he would want to become as a grown man; he replied: “An officer in the Imperial Army”. He had to express what his reasons for that choice were (below). 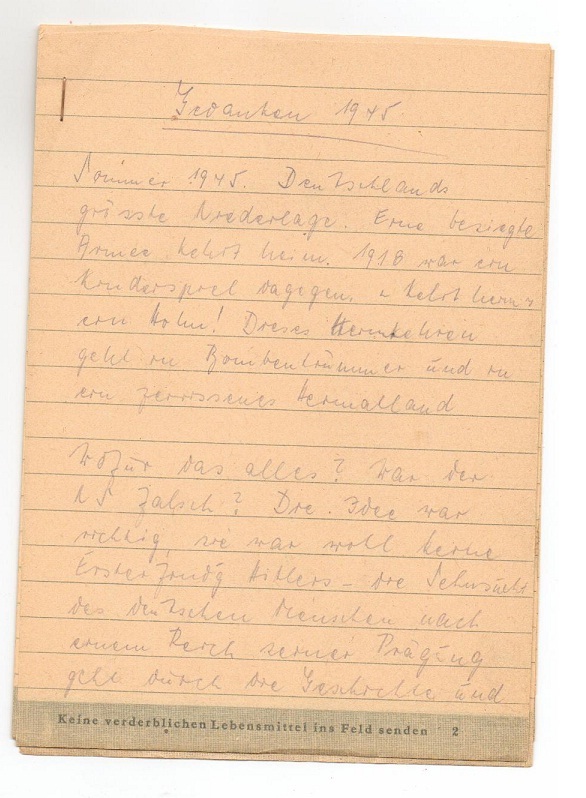 The hand-written justification of Hans Guhr about his future career choice. 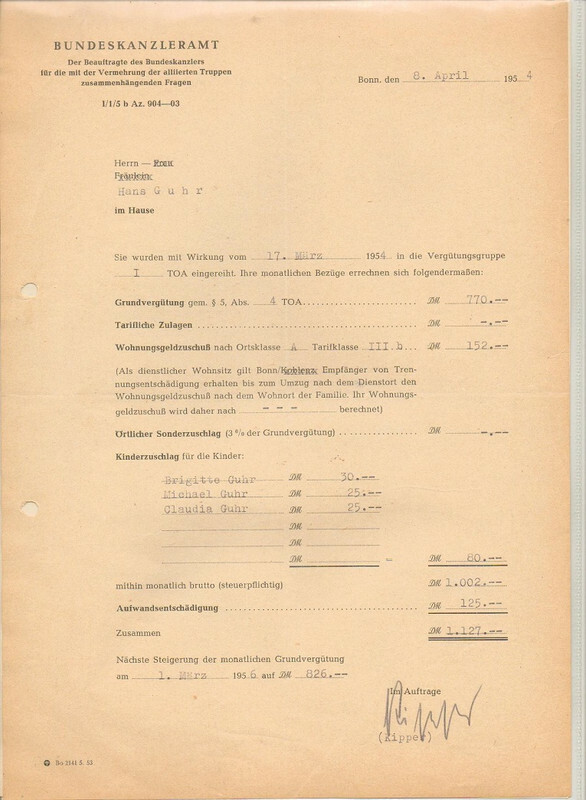 After completing high school in 1936, he did the reglamentary service in the RAD (German National Labor Service) for two years, and after joined the army, becoming part of the 294th Inf. Div. (Gren. Rgt. 513). 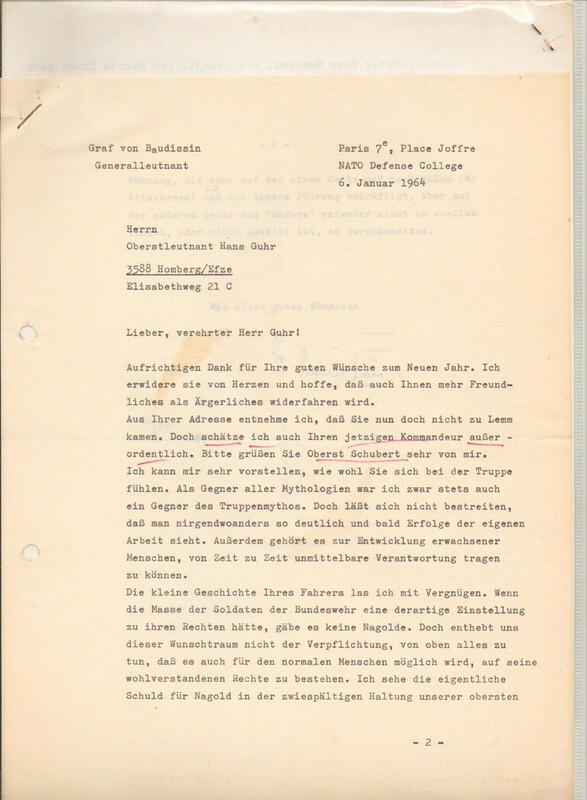 Finally, the school report from Dresden, which belonged to Hans Guhr as a young student. 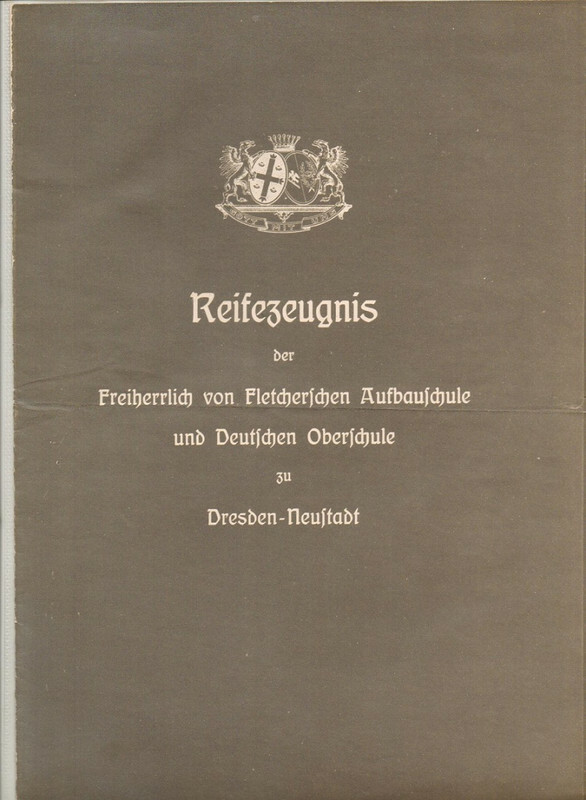 (1936). In the begging, Hans Division, the 294th, only took part in the final stages of the French campaign (occupation duty in France for the rest of 1940 and early 1941), and later engage actively in the Balkan’s campaign. 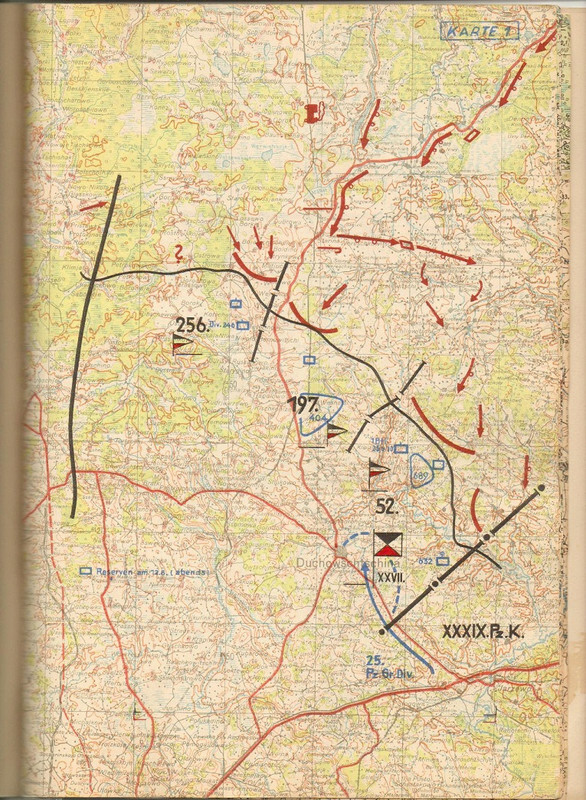 In the first stages of operation Barbarossa, the Division (which formed part of the 6th Army) took the spearhead of Army Group South, leading the battle deep into soviet soil and achieving very important victories. 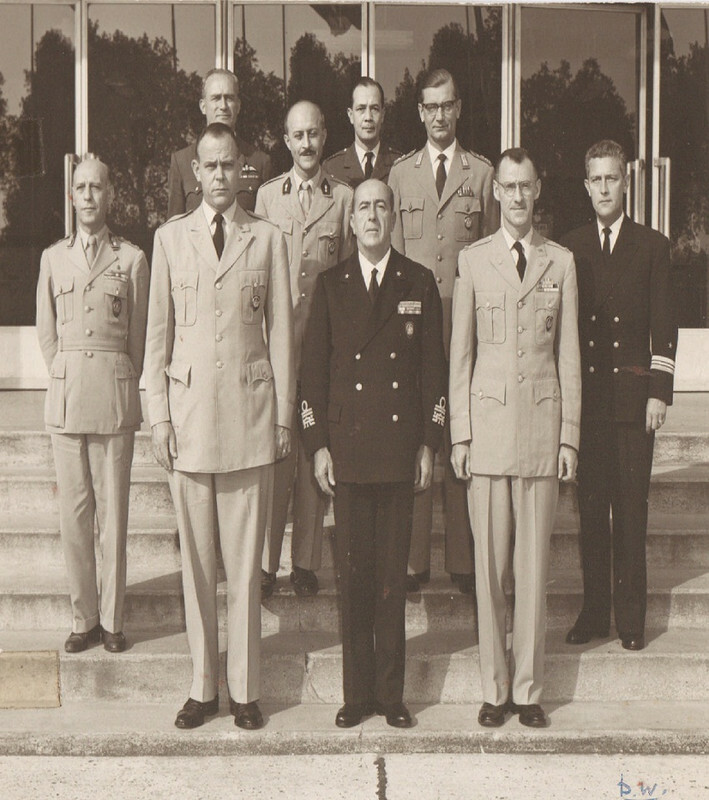 At this point, Friedrich Paulus was in formal command. 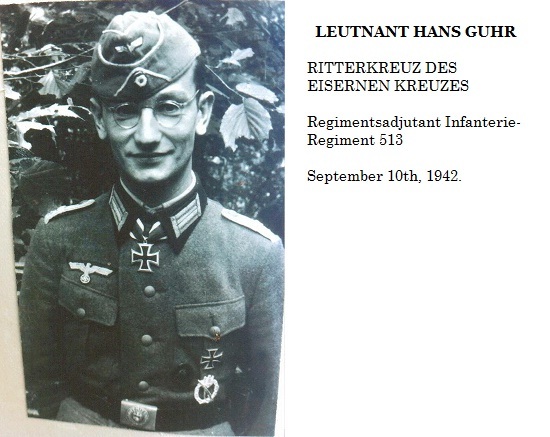 Hans would later join the 513th Grenadier Regiment, which was created on October 15th 1942 by the renaming of the 513 Infantry Regiment and the 294th Infantry Division assumed. On November 2th 1943, the II and III. Battalion disbanded. The regiment was destroyed in August 1944 in the southern Ukraine. 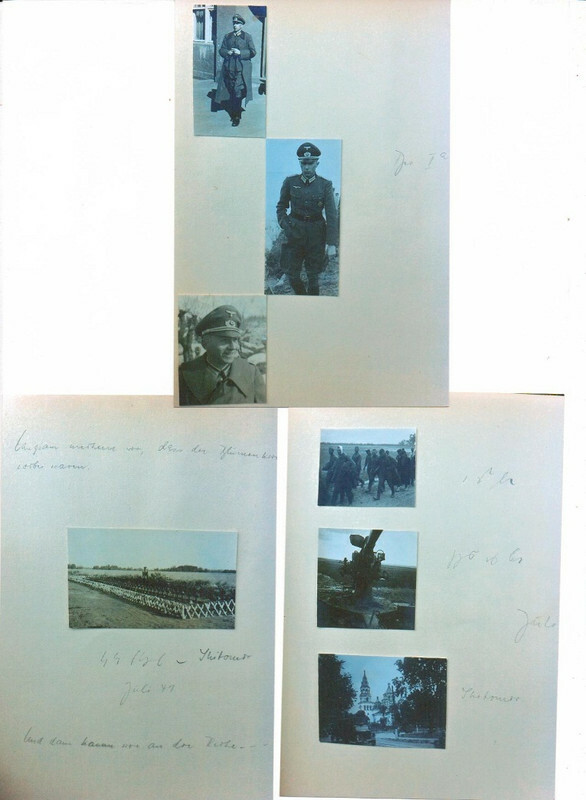 Major Hans Guhr, with a photo and the section in his Soldbuch were it displays the entry for the Ritterkreuz. 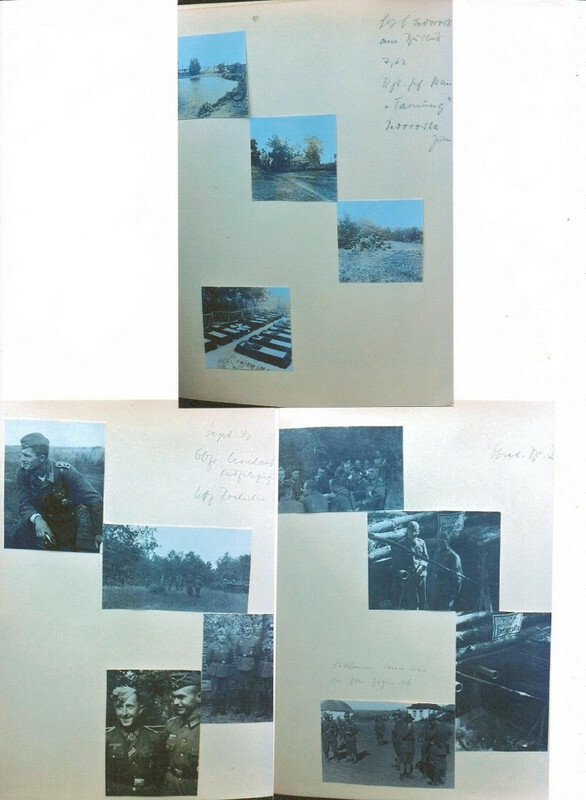 A young Hans Guhr is seen here, on two photos of his personal album. He holds the rank of Leutnant. 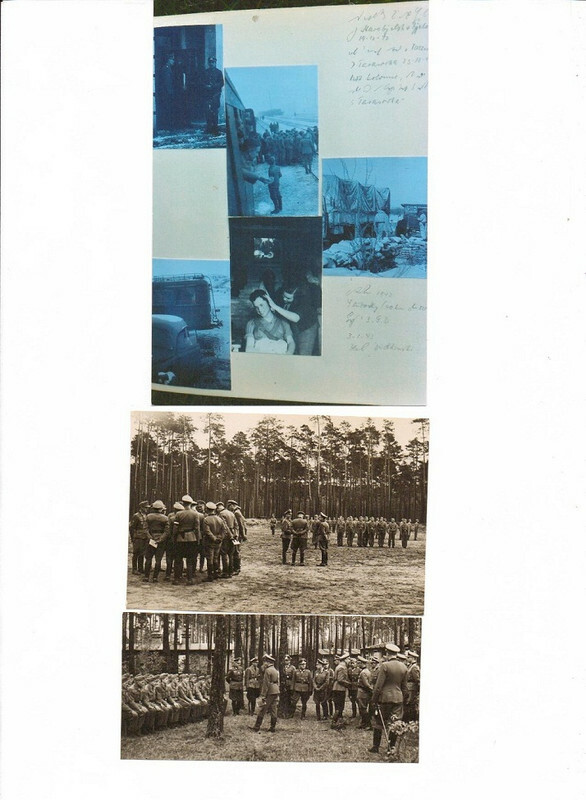 Another set of photos of young soldier Guhr as an adjutant during his stay in Russia. 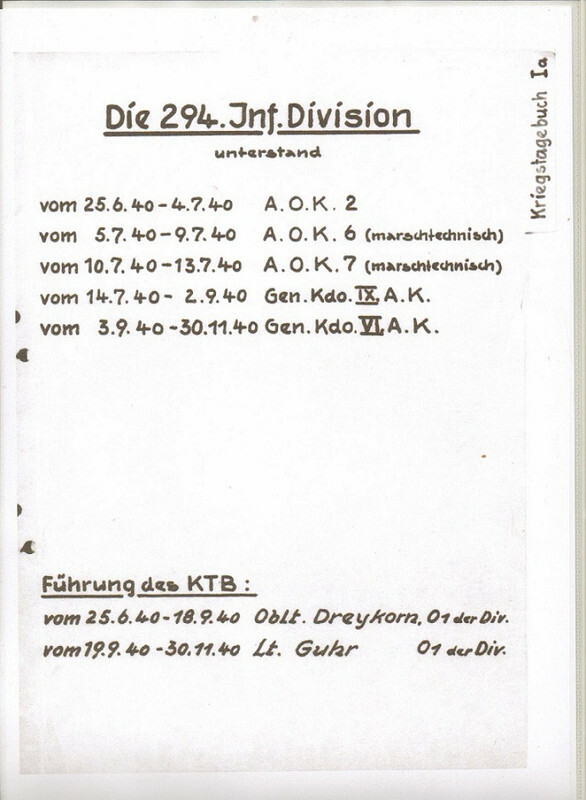 Hans Guhr’s soldbuch, showing the entries of promotion, finally reaching the rank of Major, in 1945. 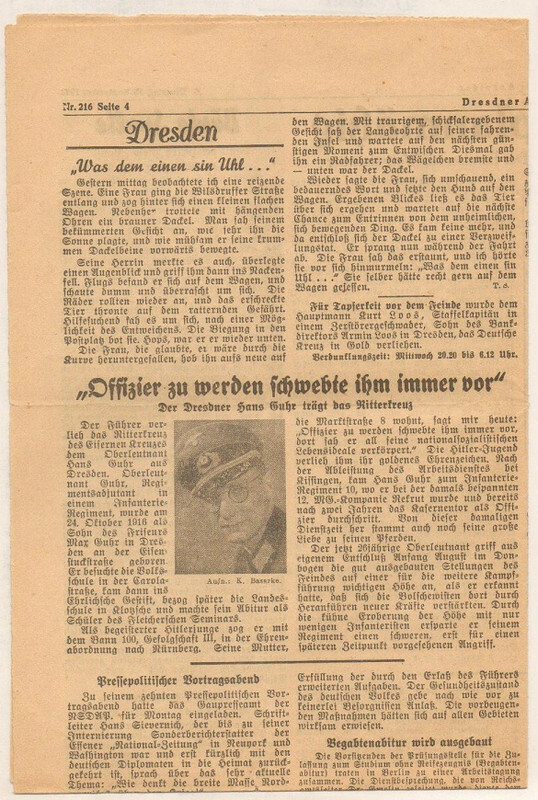 A newspaper of 1942, from the city of Dresden, informing the award to Hans Guhr. 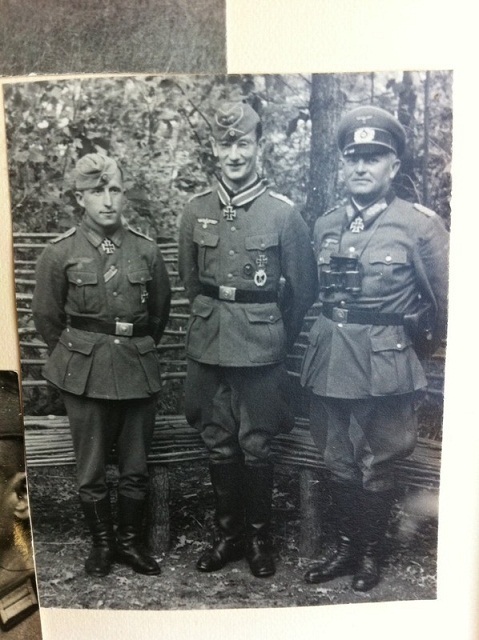 Hans Guhr after his award ceremony, alongside two other RK’s winner: left Georg Rietscher, NCO of 14th InfRgt 513, later awarded KC with Oakleaves and Johannes Block, just promoted from Oberst to General and commander of the 294th InfDiv. 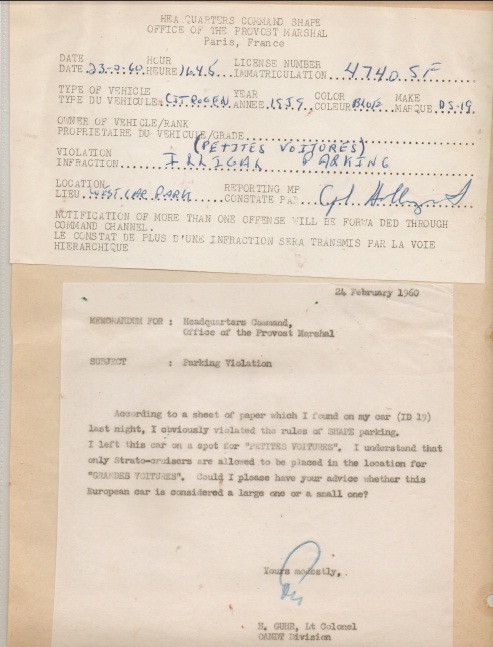 He was awarded the Oakleaves on November 22th 1943. 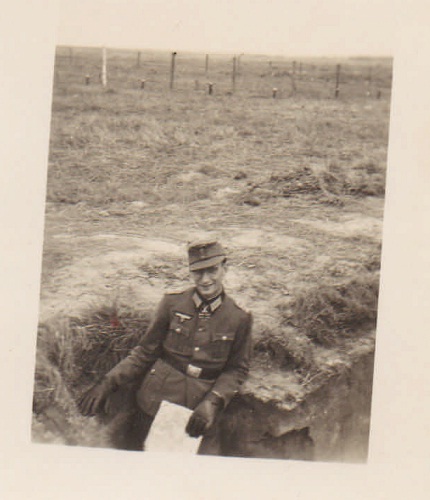 Oberleutnant Hans Guhr, on the field. (1942). Hans Guhr during maneuvers with other Knight’s cross soldiers. In Zaithain, Hans met his future wife, Ilse Lemmerzahl. 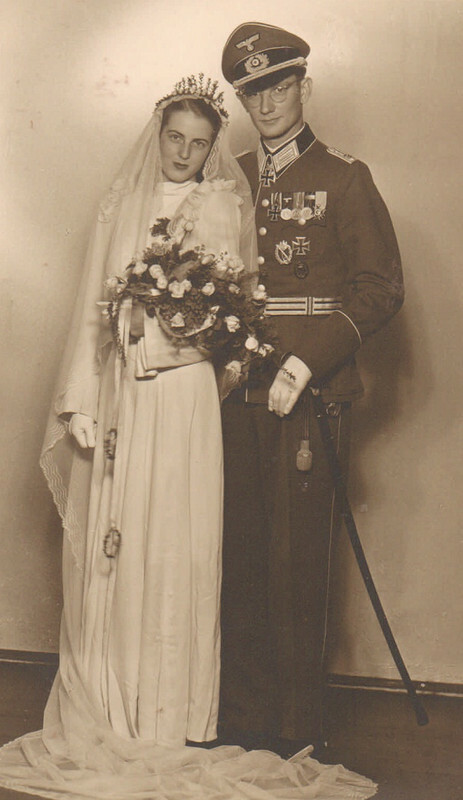 She was working during her Pflichtjahr in the family of Oberst Ramcke during 1940. • Close Combat Badge (Nahkampfspange) in bronce. • Long Service award medal. 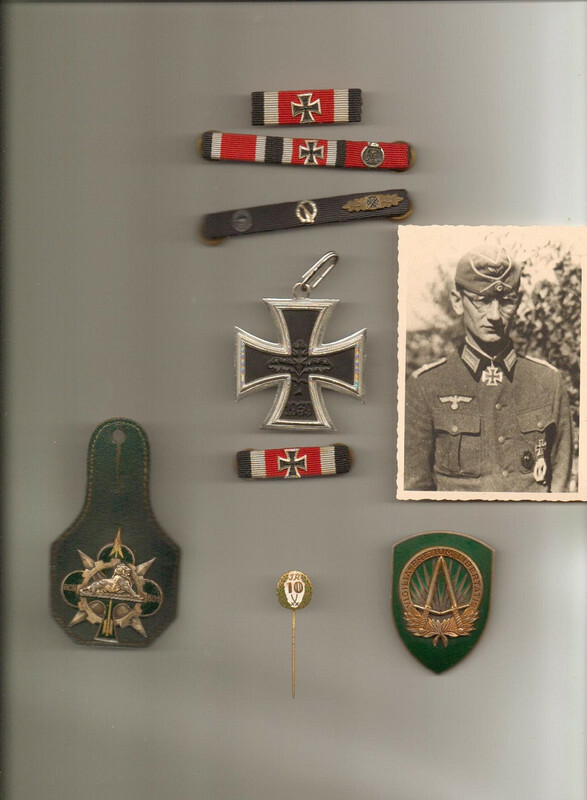 • Knight's Cross of the Iron Cross, awarded on 10.09.1942 and entered in the pay book on 19/09/1942. 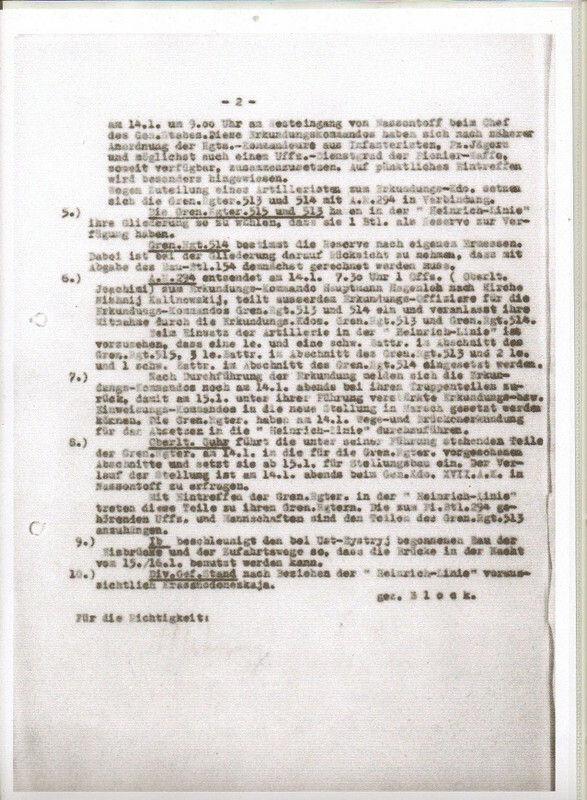 A page of Hans Guhr’s soldbuch. On the right, some of his medals. 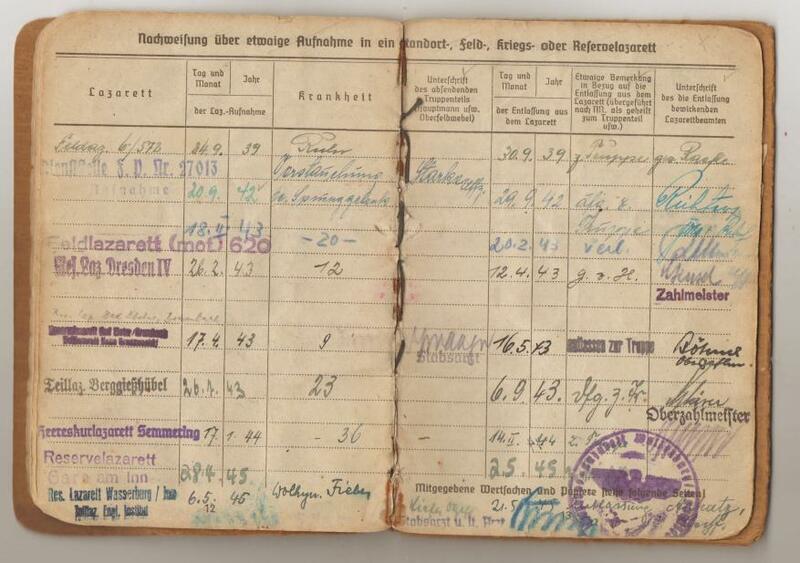 The most important page of the Soldbuch: the entry of the Ritterkreuz, awarded 10.09.1942, but written here on 19.09.1942. In today's German army the term Ritterkreuz-Auftrag ("Knight's Cross Mission") refers to a duty that is extremely aggravating, or a no-win situation. 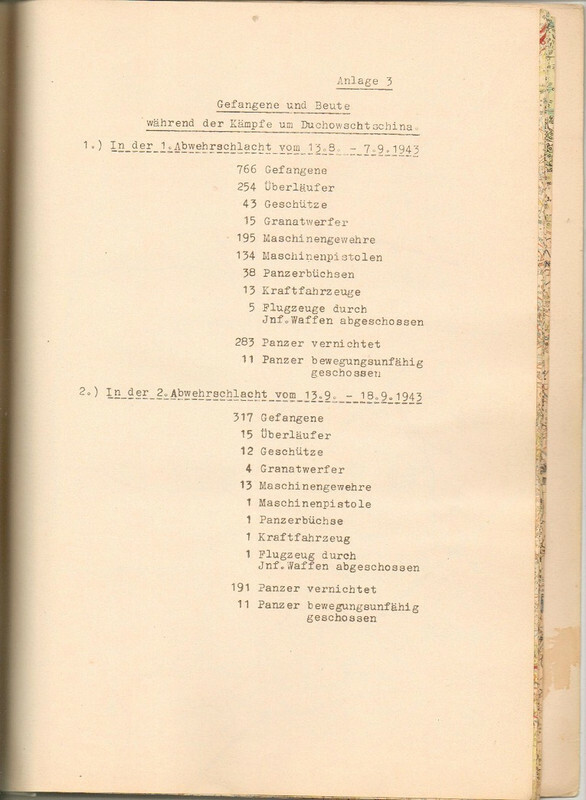 Major Guhr endured many wounds during his time on the Eastern Front, and here are his soldbuch entries, with the dates and hospital checks. The first column is for the hospital’s name and location, the next set of columns is for the day, month and year admitted to the hospital. Krankheit is for the illness or injury. • Grades of frostbite on both feet, Volhynia fever, Malaria, Myokardschaden (Myocardial) problems. 4. 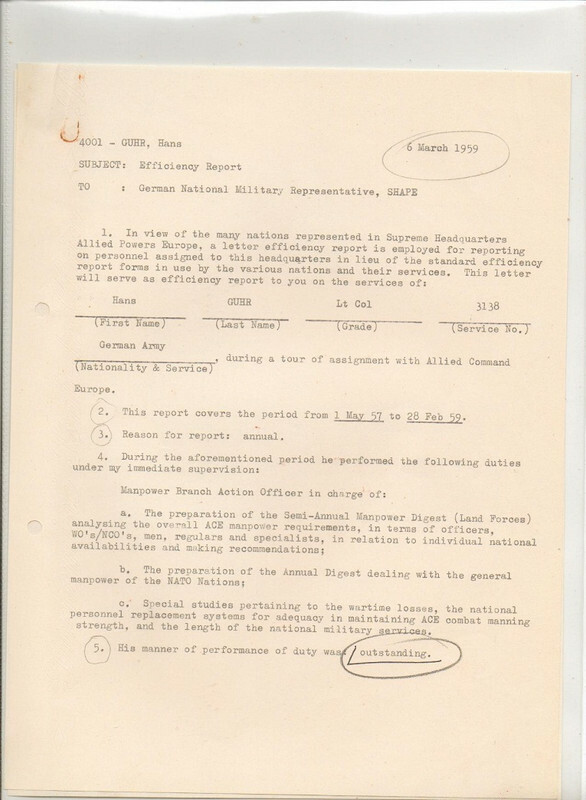 Paper history and official records from the Army (War period). 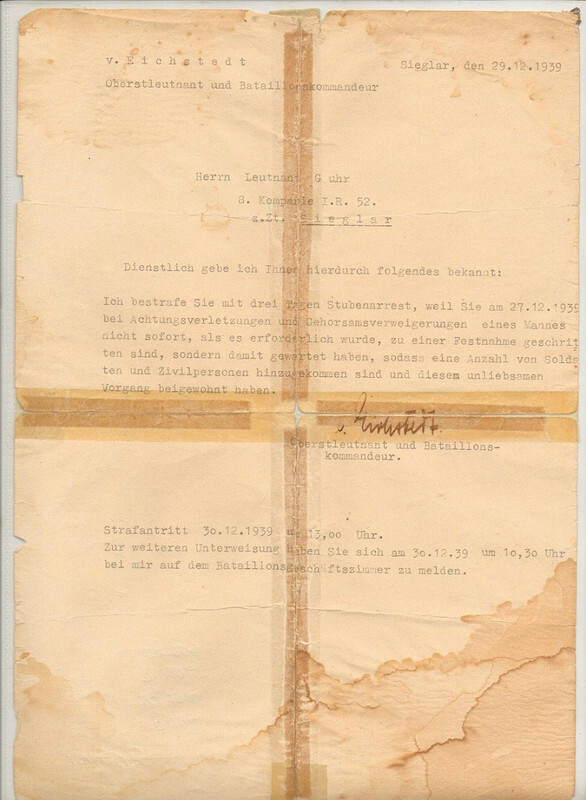 This notification was made to Leutnant Guhr, regarding a confinement to quarters for 3 days, involving some problematic encounters with a soldier refusing to obey orders from a superior. 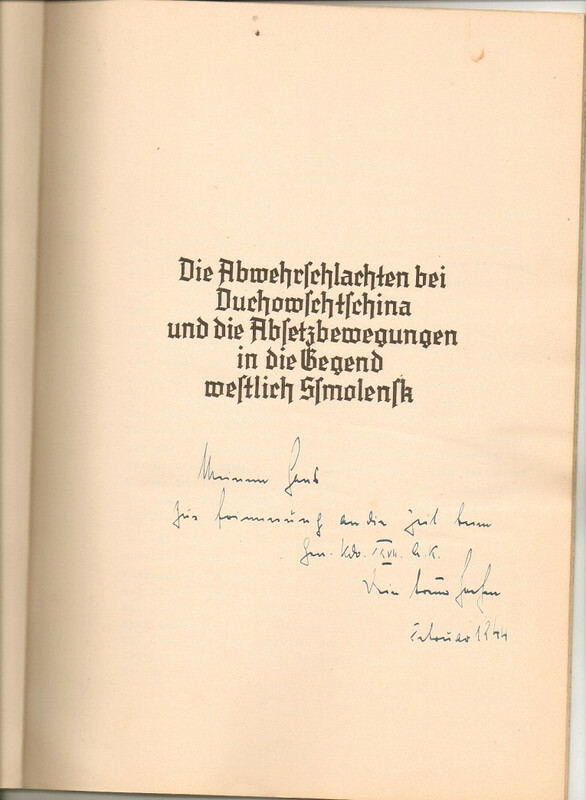 Signed by Werner von Eichstedt (RKT), Lieutenant Colonel and battalion commander of II Battalion, IR52. (Eichsted was killed on 26.08.1944 in Kishinev, Moldova). 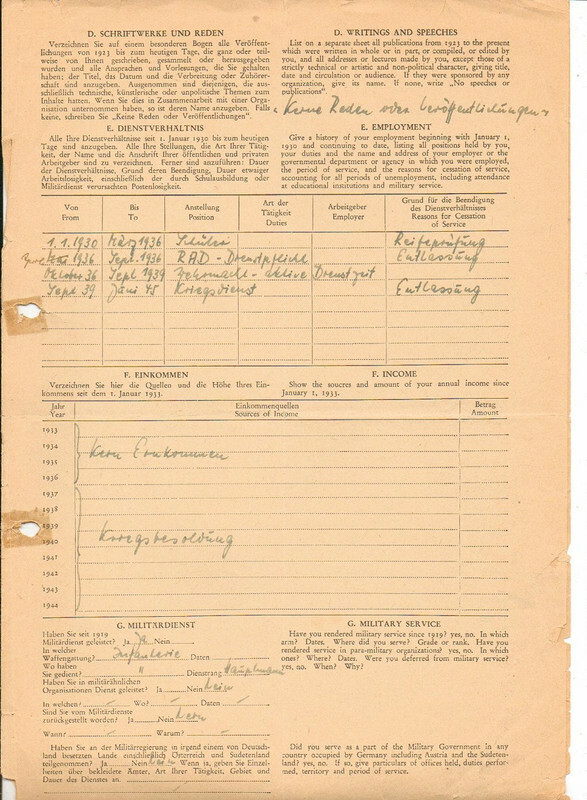 Orders issued to Lt. Guhr, I.R.513, 294th regarding his transfer. 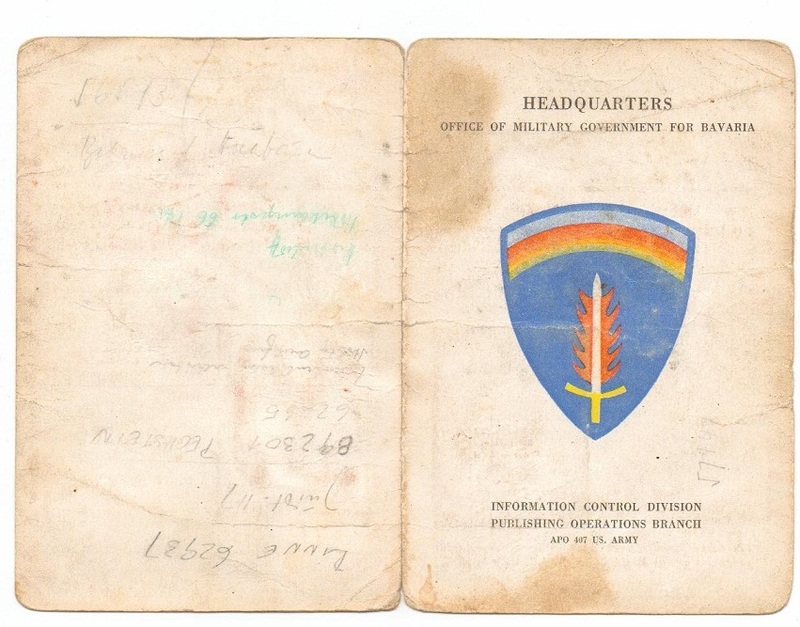 Management's war diary (KTB), the 294th Infantry Division during the period from 09/19/40 to 11/30/40 by Lt. Guhr. "The division reported Oberleutnant Guhr as a substitute teacher for the comp-driver-training course Oberlt (A) G, clock Regt. I.R.513 adj. “. 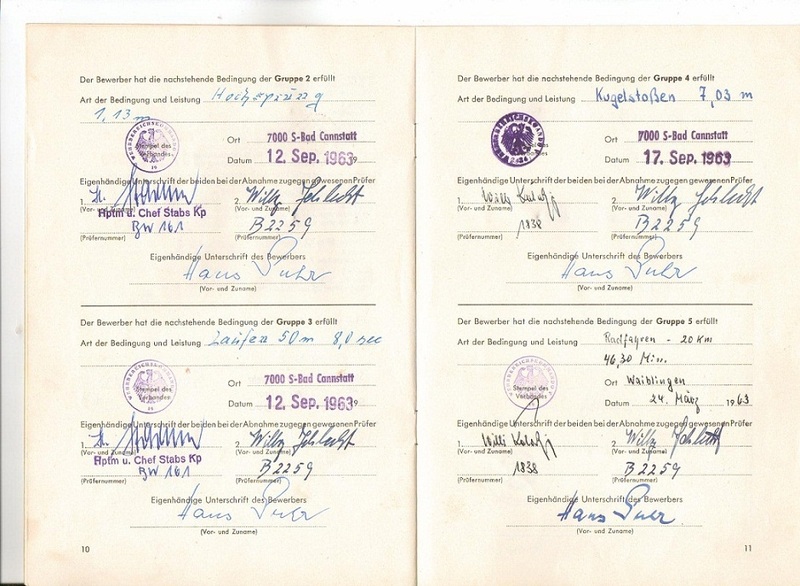 In other words, Hans Guhr designation as a teacher of a war course. 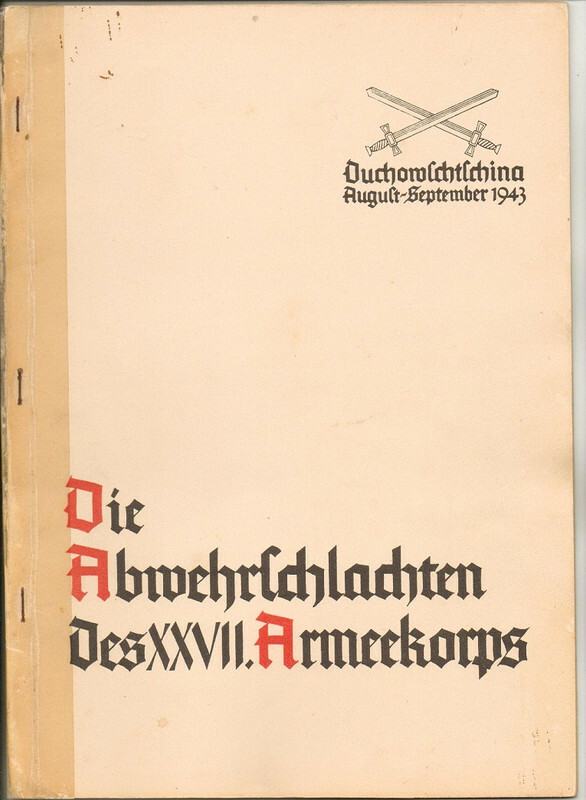 Abwehrschlacht XXVII. Armeekorps – Defense battle report. Oberst i.G. 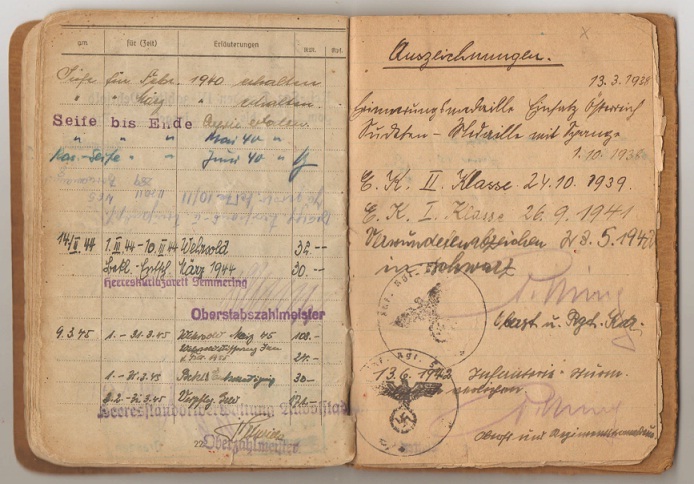 Staats came back from war as a Russian POW on the 16th January 1956, which is mentioned in the diary of Hans Guhr. O i.G. Staats signed the RD.A in Hans solduch page 3. 5. 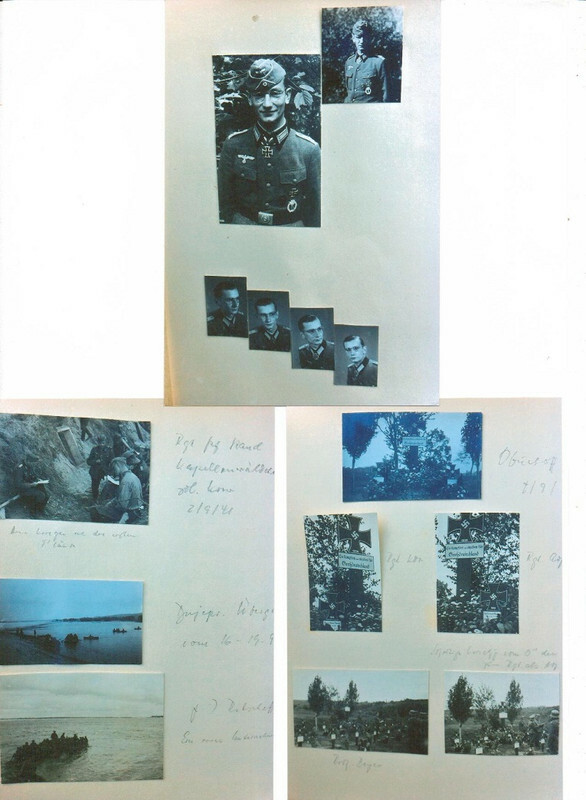 The photo album of Major Hans Guhr. 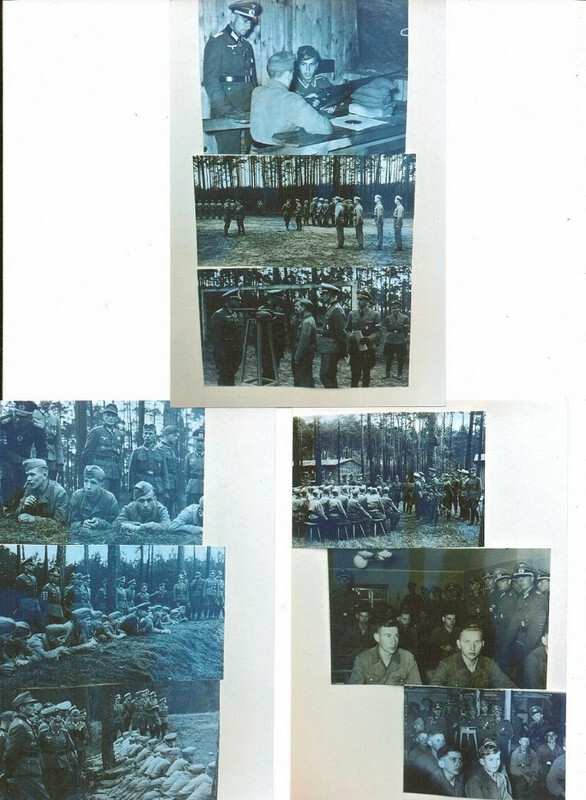 The complete set of photos from Hans Guhr war album. Last edited by Sepp45; 07-22-2012 at 08:58 PM. 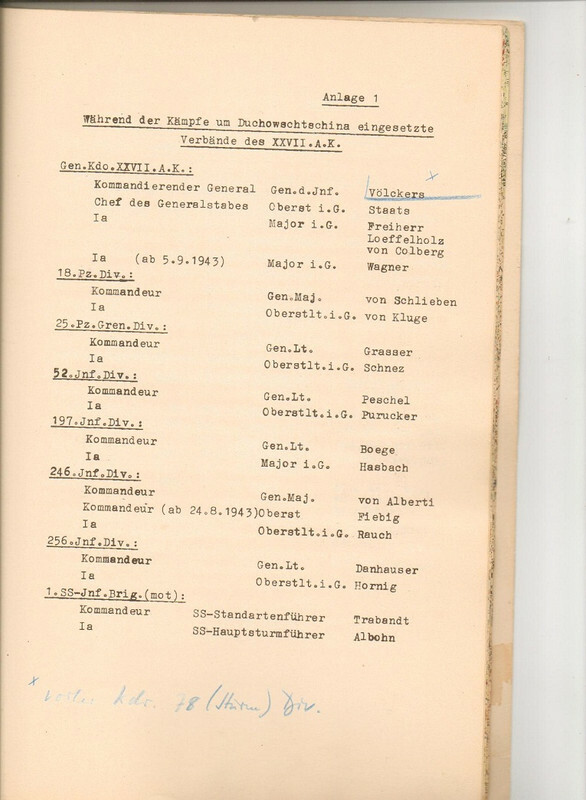 • " In unseren Kreisen..." as of 12/06/45. 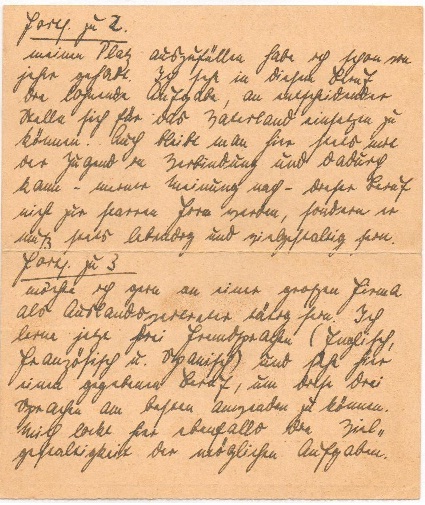 To become an official reporter of a newspaper in Wiesbaden, he wrote a letter of application and sent a curriculum vitae - four pages and handwritten. 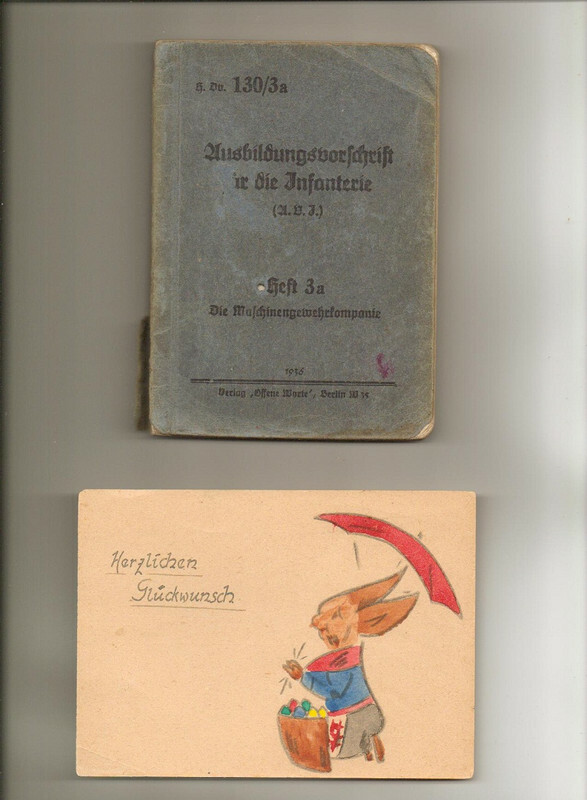 He tried to become an interpretor in the office of the prison of Hameln and worked as an " artist", painting small pictures, colored by his wife. 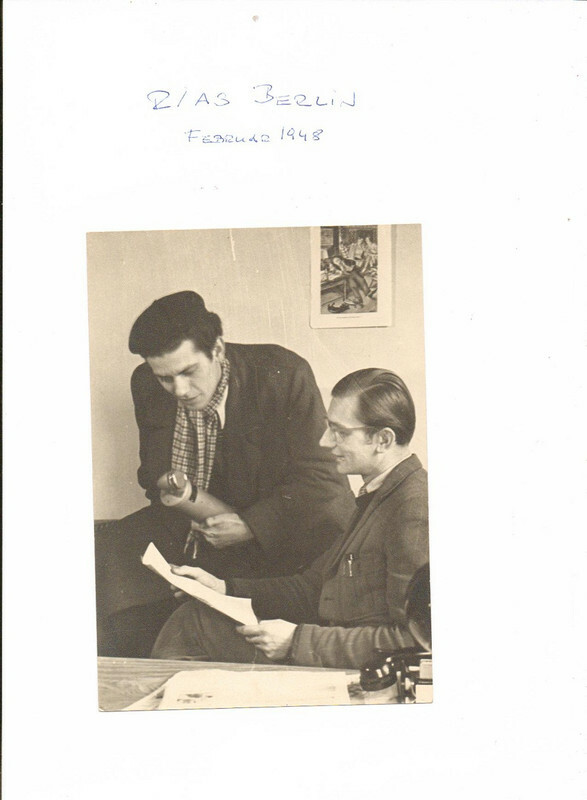 In 1946 he started his career as a journalist in Hanover (British zone of occupation), and was one of the first reporters of the NWDR (existing as of today) working together with the famous Werner Höfer in the building of the Anzeiger Hochhaus in Hanover. His small office was next to Augstein and Becker, the editors of the Spiegel magazine. His supervisor was Bill Acrill, the man who was responsible for the British Governement to check the "right wording"; later he became the editor of the Daily and Sunday Express in England. 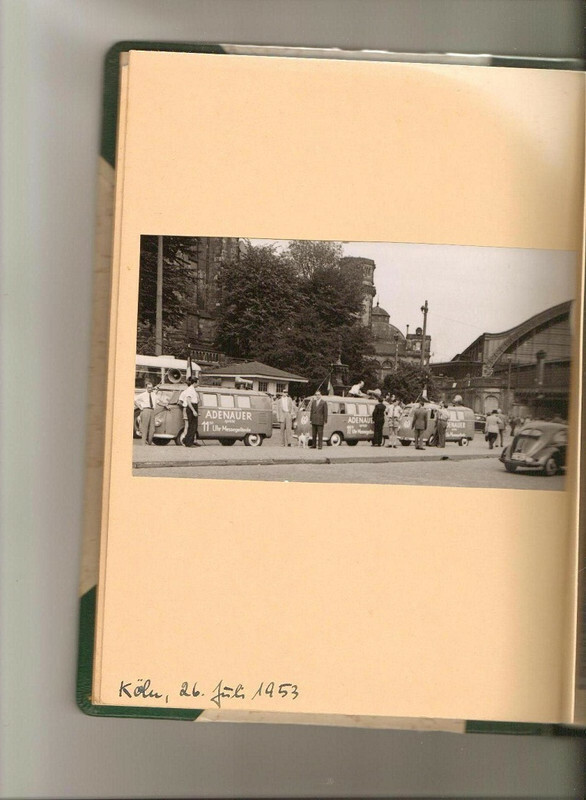 Hans also worked a short time in Berlin for the RIAS in the American Sector. This reflex an important part of history, since we can see the change of mentality of an entire country, devasted by war and now trying to put the pieces together one more time. Working in the RIAS, February 1948. 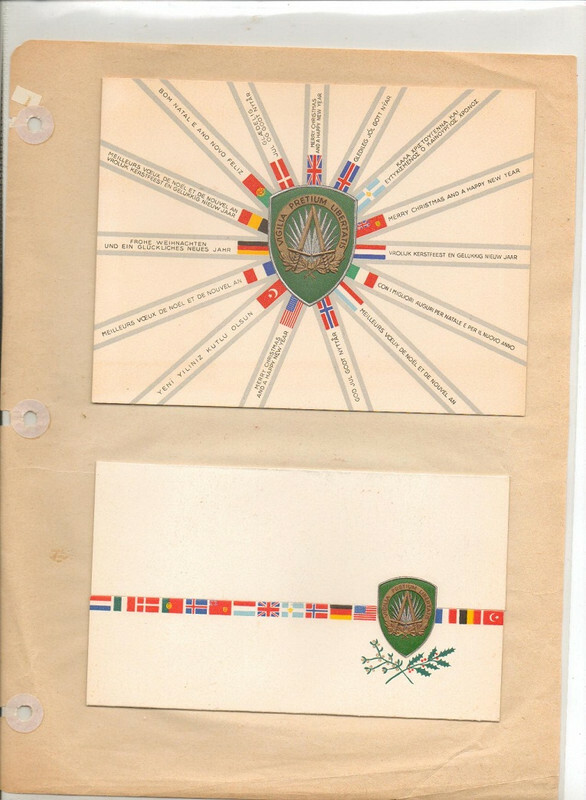 Credentials and one of the drawings he made after the war. 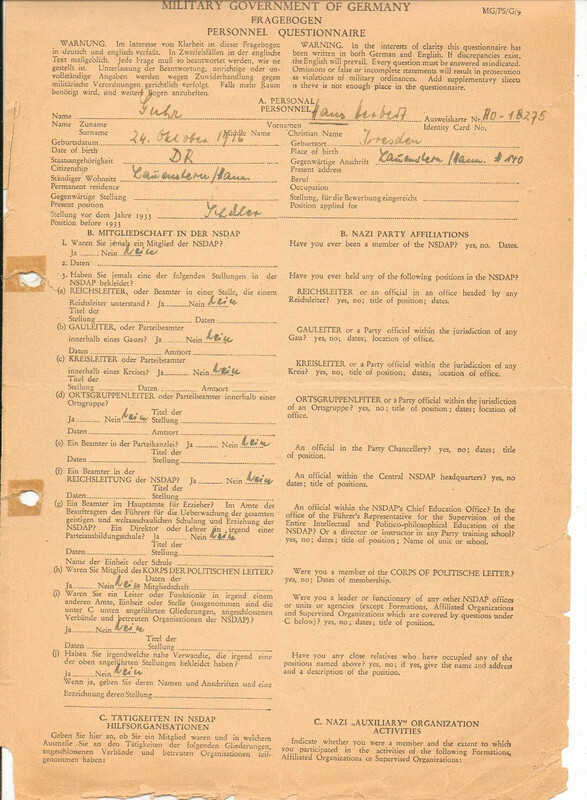 Due to his wounds received during the war, he required a special “war veteran” disable card. 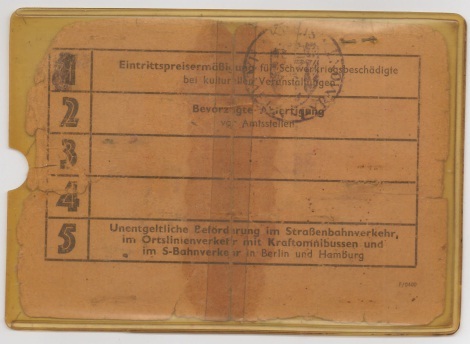 This card was issued to Hans Guhr in 1947 and had a valid use until the end of 1950, but it was extended to 1952. Back side of the card. The foto shows him smoking one. 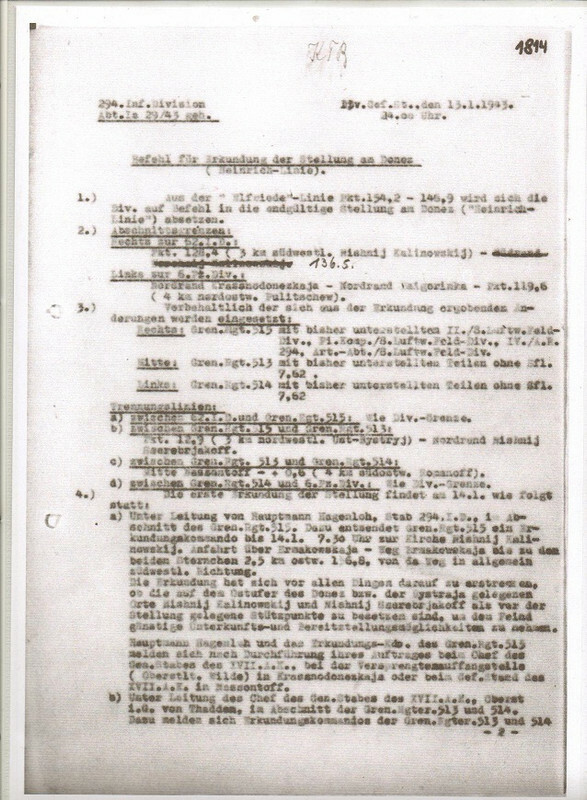 This is Hans Guhr “denazification questionnaire", page 1. Dated 02/05/1946. 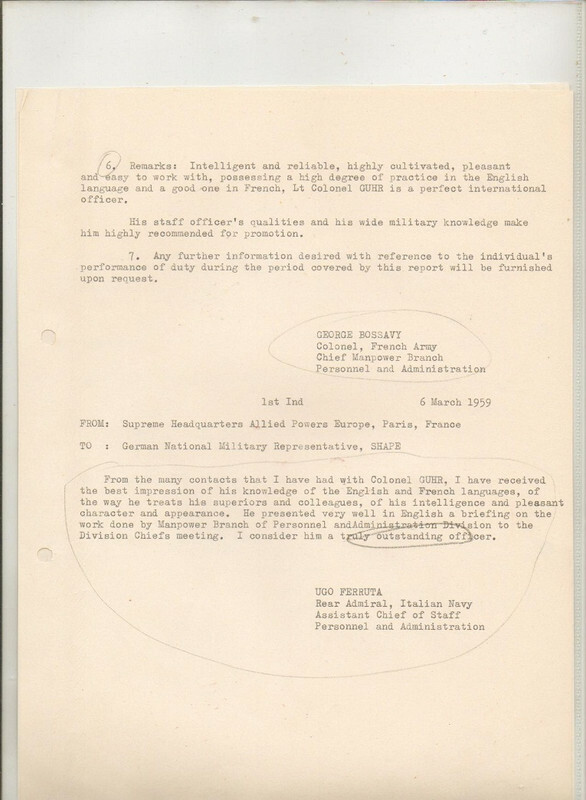 As can be seen, the questionnaire is made in both German and English, in the zone of France, it was translated in french too, same in Elsass - Lothringen. The photos above are from his Press ID “Northwest German Journalists Association”, No. 2113, Hanover. Dated 14/09/1948 and stamped by the Municipal Population Office. 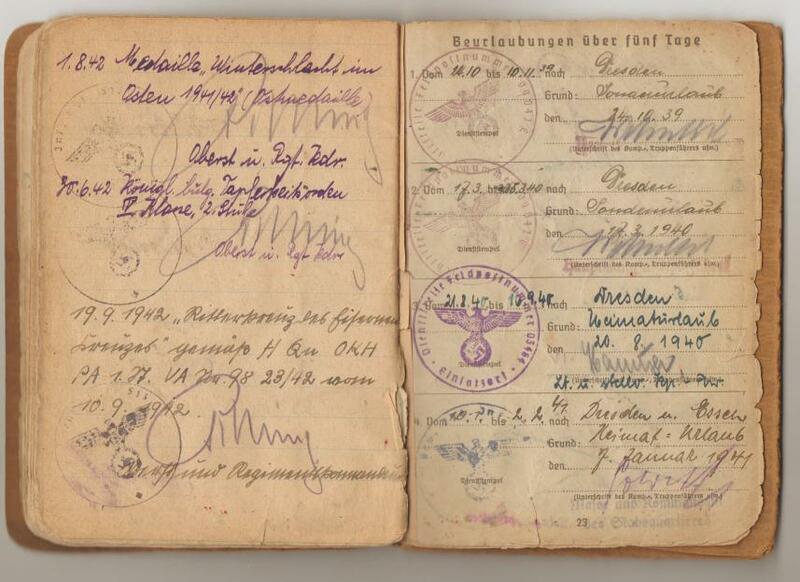 Also stamped by the police chief SK-Hanover, dated 10/30/48 and from the railway police and the post office. 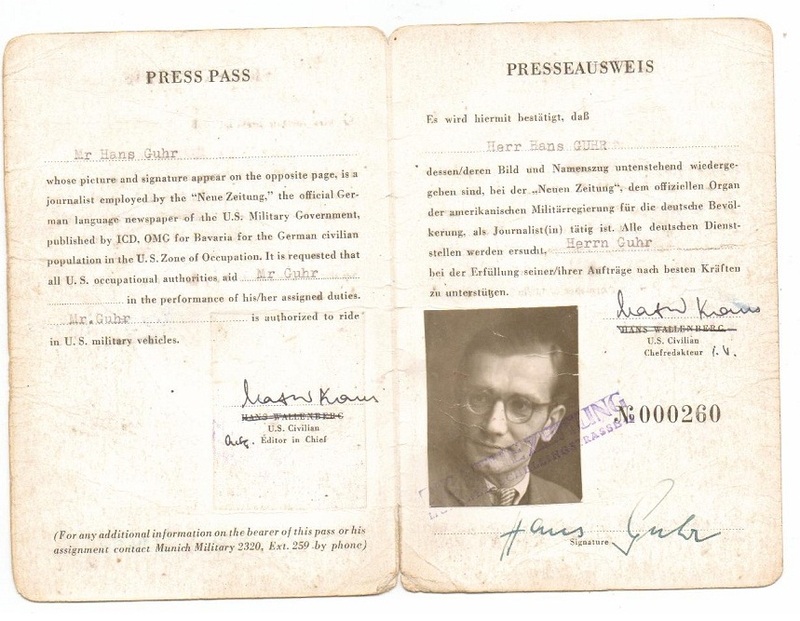 Another press pass, issued by the US administration in Bavaria, dated 1948. 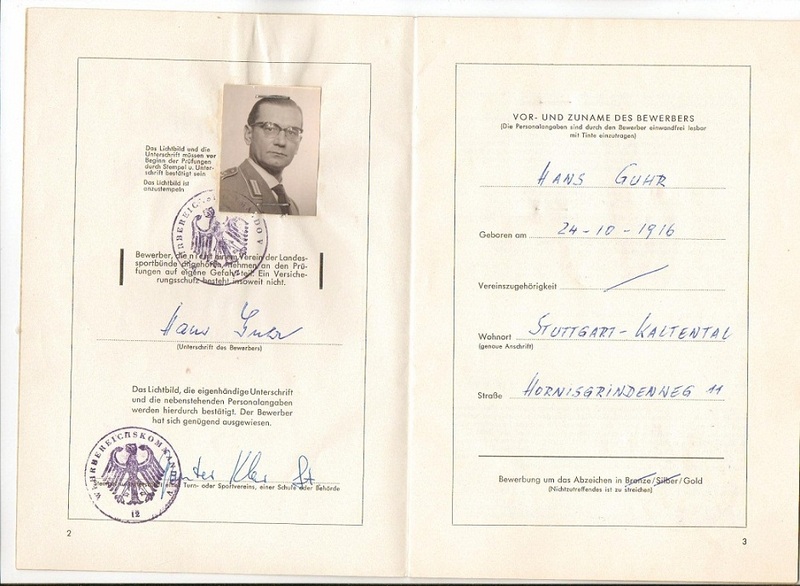 As said earlier, after WWII ended, Hans Guhr initiated a career as a certified news journalist. 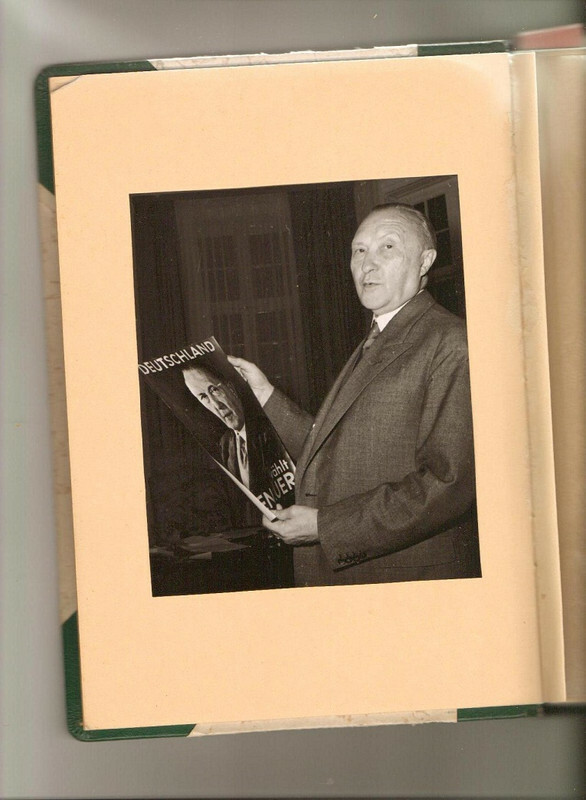 This would lead later to a great chance to serve his country once more, now under the wing of Dr. Konrad Adenauer (01.05.1876 – 5.19.1967), Germany’s first Chancellor. As Chancellor of Germany from 1949 to 1963, he led his country from the ruins of World War II to a powerful and prosperous nation that made close relations with the old enemies France, Great Britain and the United States. 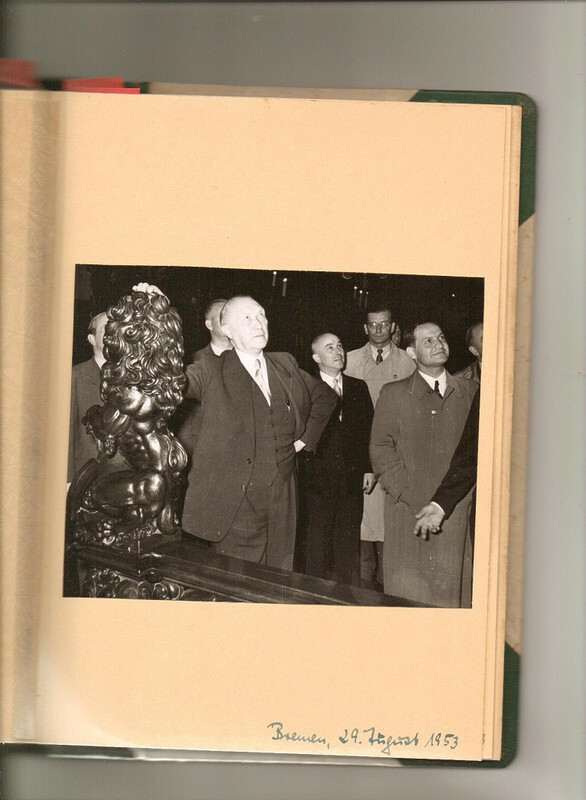 Adenauer, dubbed "Der Alte" ("the old one") was deeply committed to a Western-oriented foreign policy and restoring the position of West Germany on the world stage. He worked to restore the West German economy from the destruction in World War II to a central position in Europe, rebuilt its army and came to terms with France and made his nation a member of NATO and a firm ally of the United States. 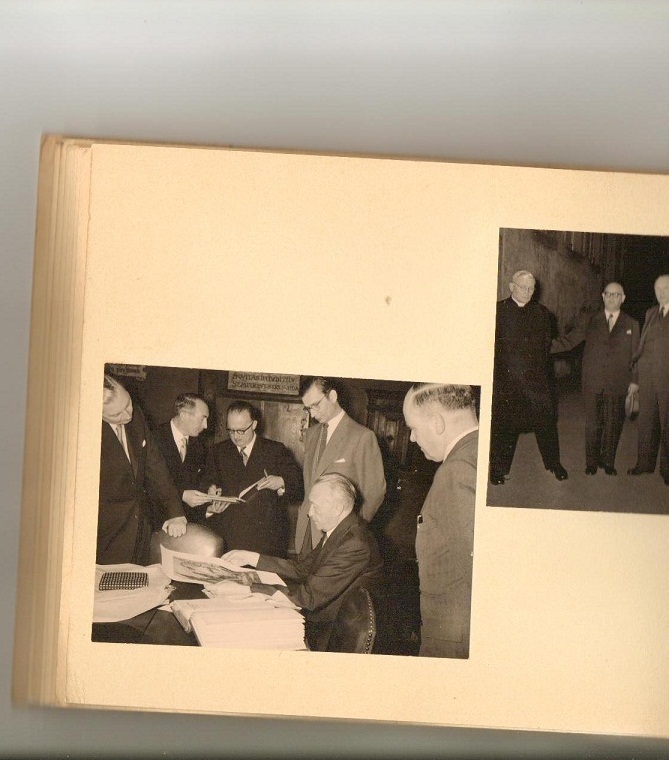 Here I present some photos of two photo albums (over 130 images) during the election campaign of Dr. Konrad Adenauer, September 26th 1953. 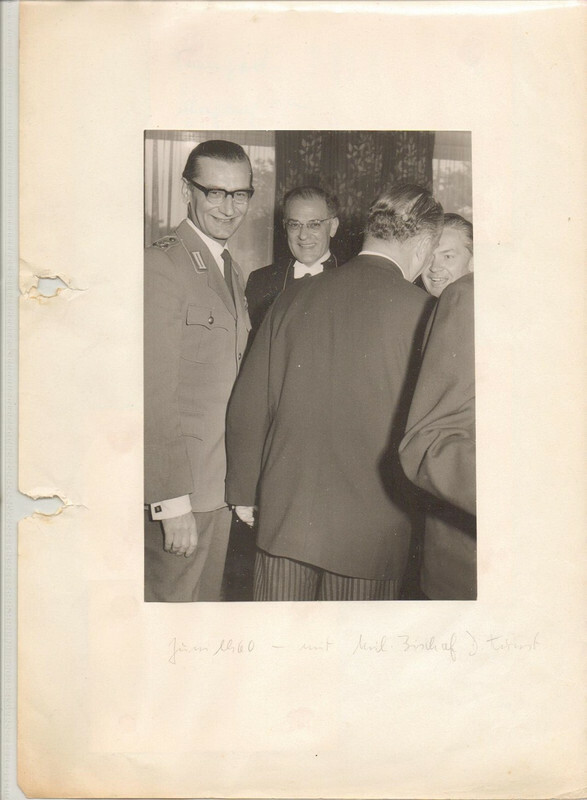 Many close-ups of Hans Guhr working in the name of the responsible Secretary of State Dr. Lenz. 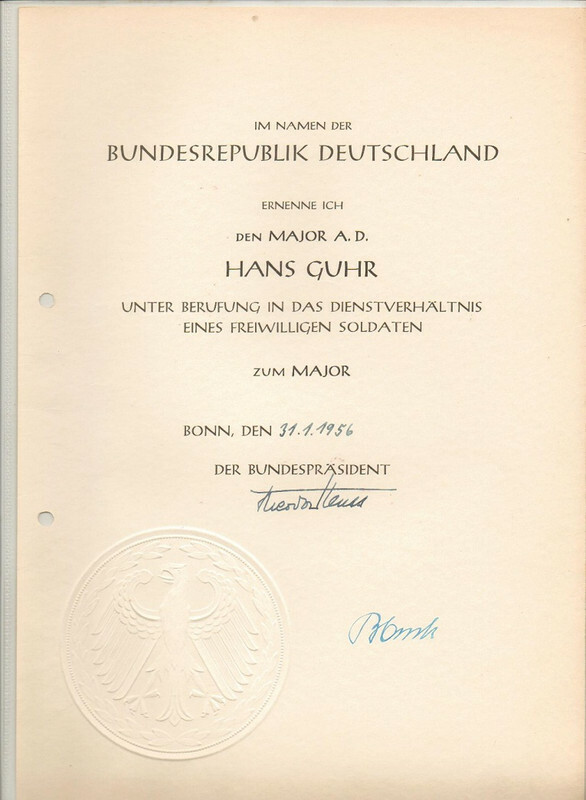 Certification of Hans Guhr and his team for Dr. Adenauer's press office. 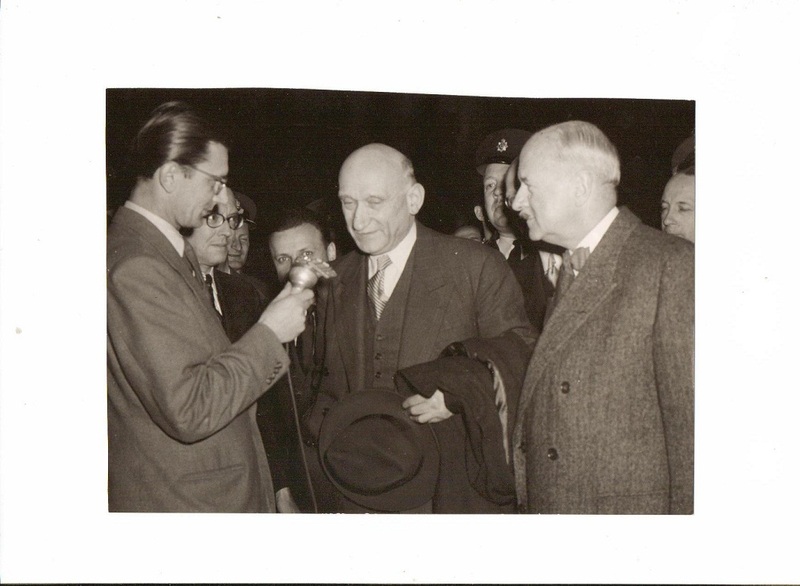 Hans Guhr interviewing Robert Schumann, the Minister of Foreign Affaires of France, 23.May 1952. On the right the Ambassador of France in Bonn. Hans Guhr, during a discussion with young people: "...Do the young people want to become soldiers again?". 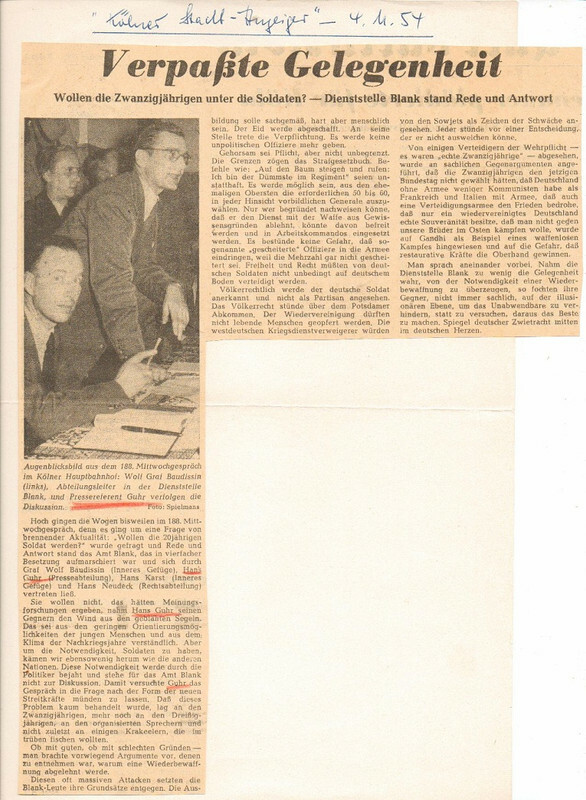 Cologne 04.11.1954 ( in front Graf Baudissin, at that time colonel and responsible for the rebuilding of the German Armed Foreces). 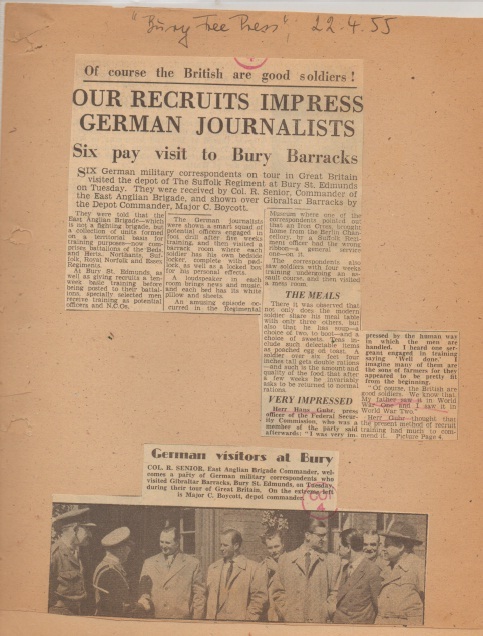 A newspaper record, dated 22.04.1955, about a visit of German journalist (Hans Guhr in the picture) to a British army barracks (The Sulfulk Regiment). Another photo of the same trip, now on a R.A.F. base. April 1955. The named members of the trip are all wellknown at that time and later on. 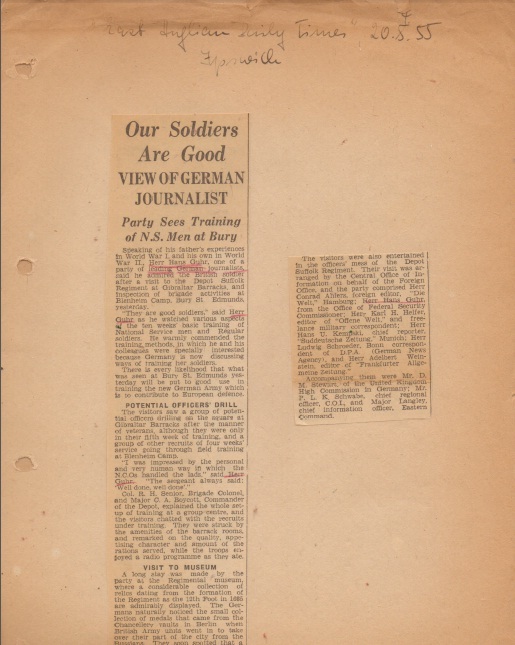 Another newspaper cut, dated 20.05.1955, with the words of Hans Guhr about the education of British troops. 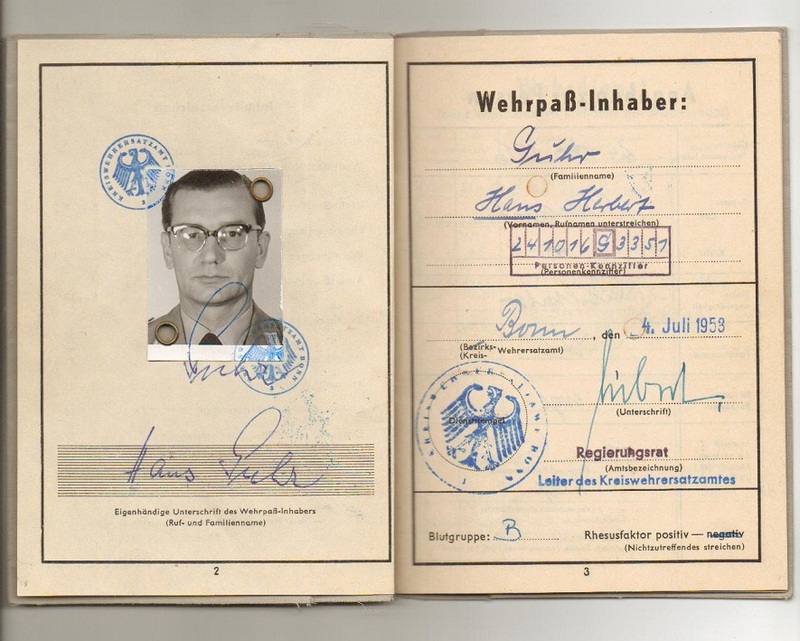 In 1954, Hans Guhr joined the Bundeswehr (West Germany Armed forces) and started his military career first in the staff of Amt Blank, later as a member of the PANDA Division in SHAPE (France), reaching the rank of Oberstleutnant im Generalstab and retiring in 1966. 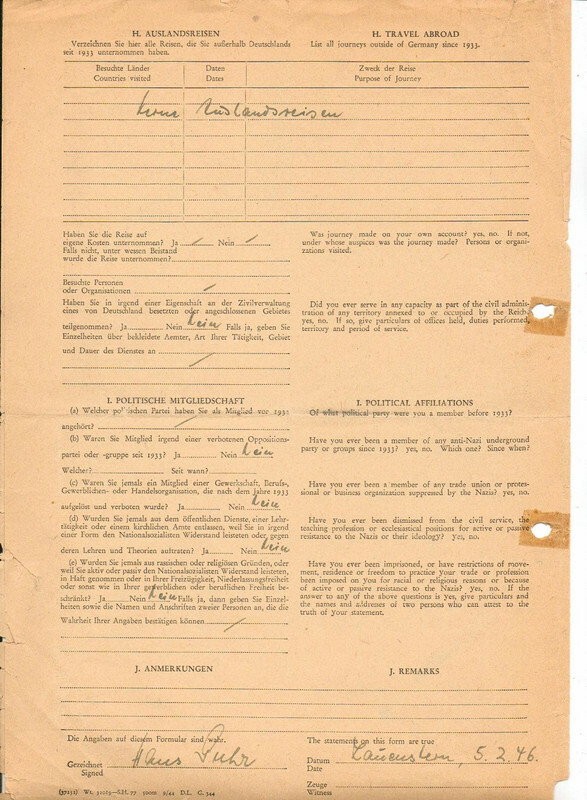 Military contract for joining the Armed Forces, date 05/04/1954. Promotion to Major, dated 31/01/1956. 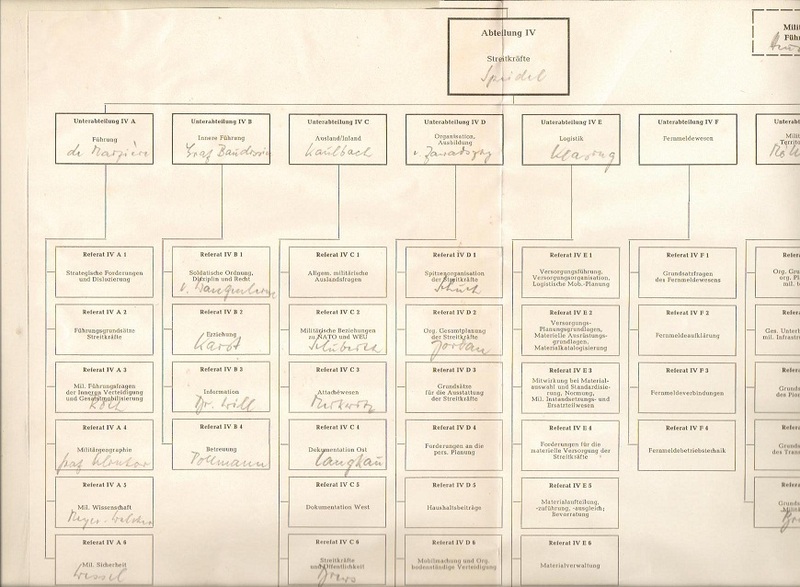 This document (one of ten) shows the structure and the heads working to start the new Bundeswehr. 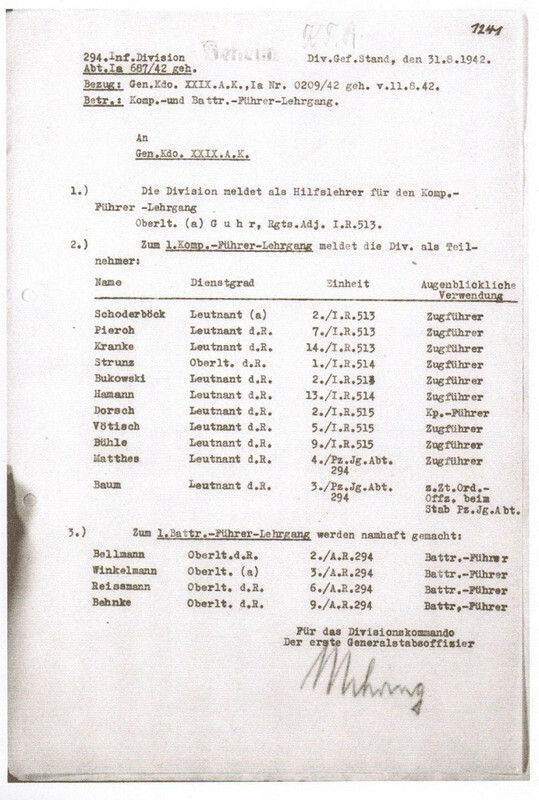 Hans Guhr was one of the candidates to become the first Btl Kdr of the Andernach battalion. 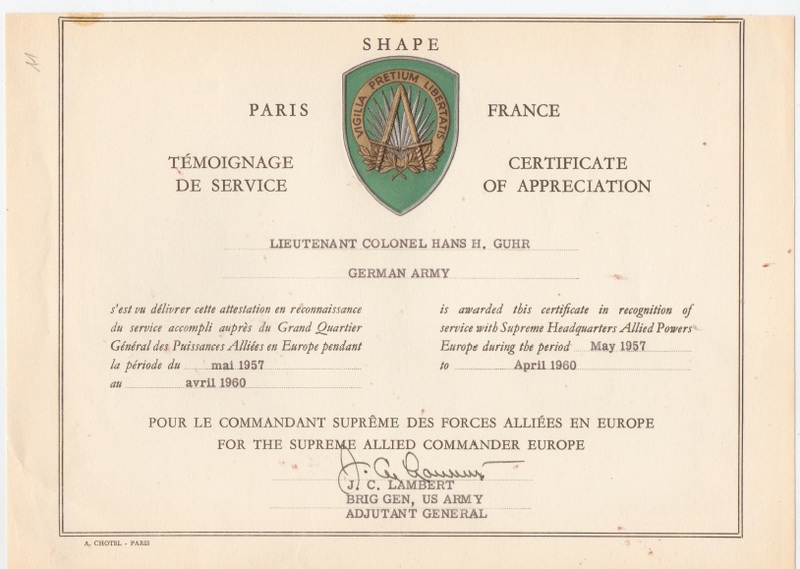 Certificate to Lt. Col. Hans Guhr, for services with the Supreme Headquarters Allied Powers (SHAPE/ Fontainebleau), from March 1957 to April 1960. LTC Michael Guhr, his son did his tour of duty in SHAPE/Mons from June 2003 to December 2006, nearly in the same division. His father international, his son national for the National Military Representative, but both responsible for manpower and personnel. June, 1960. A meeting with the bishop of Stuttgart. 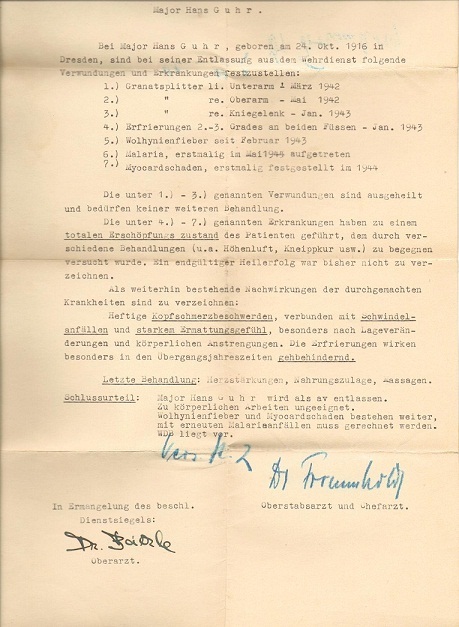 A parking place problem in SHAPE and a petition of Hans Guhr, February 25th 1960 to "solve" it. 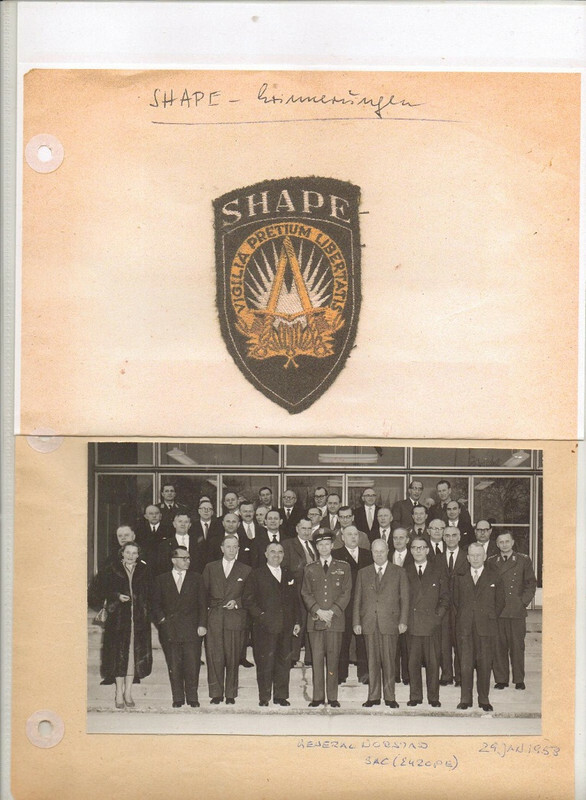 Meeting at the SHAPE HQ, 29/01/1963. 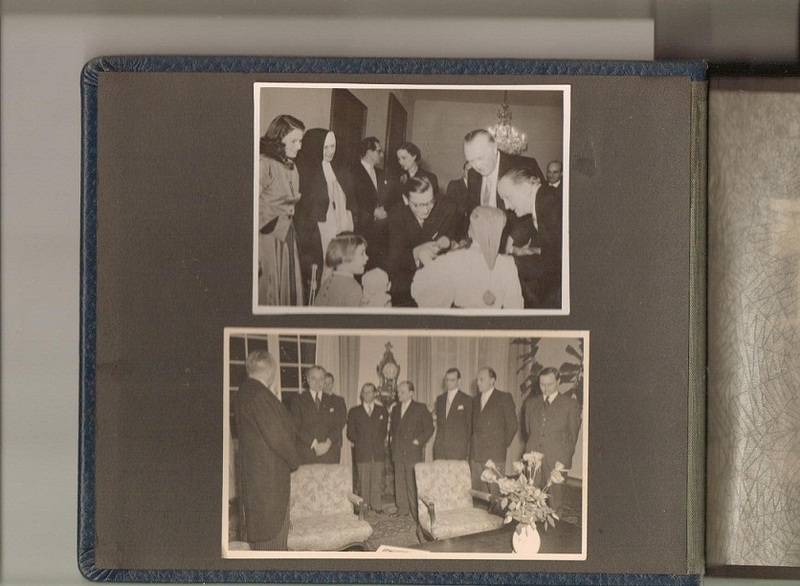 The series of photos above are from a visit of French General Charles DeGaulle, in 1961. The reason was because of German-French transport exercise. 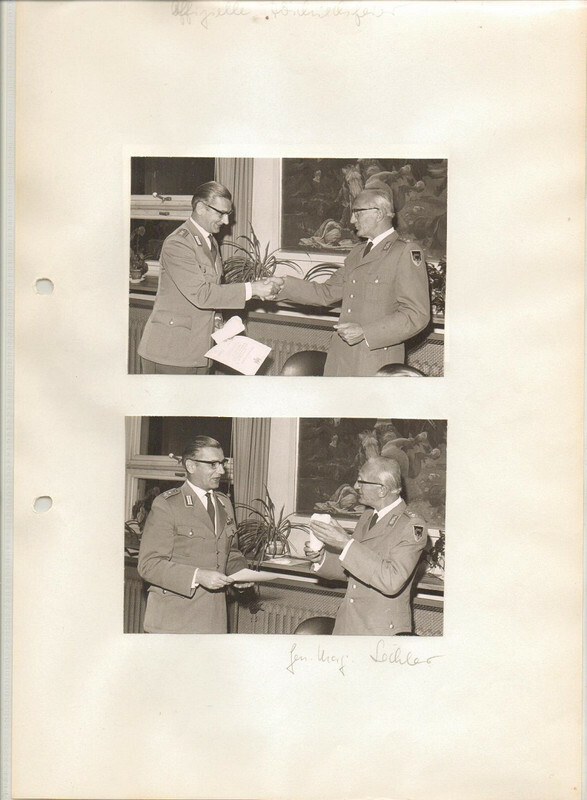 A farewell meeting between Hans Guhr and General Lechler, in 1963. 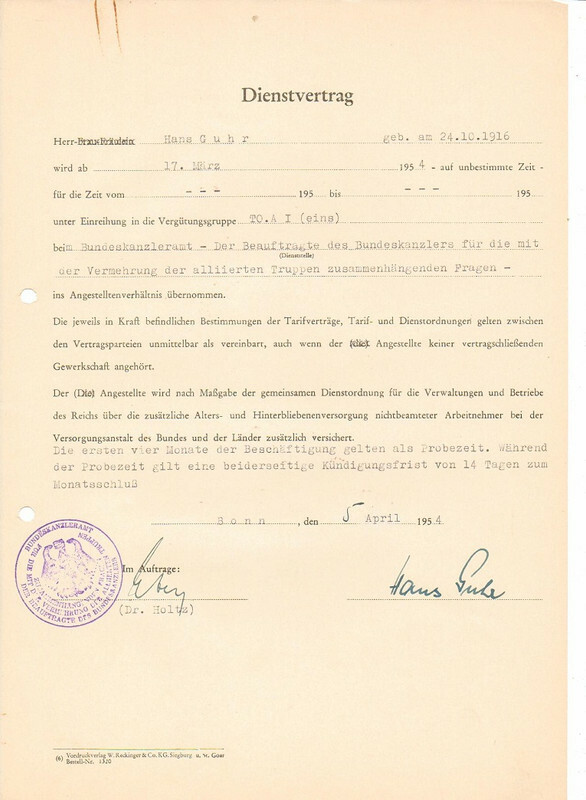 Hans Guhr “Deutsches Sportabzeichen”, or Sport badge award document, dated 1963. 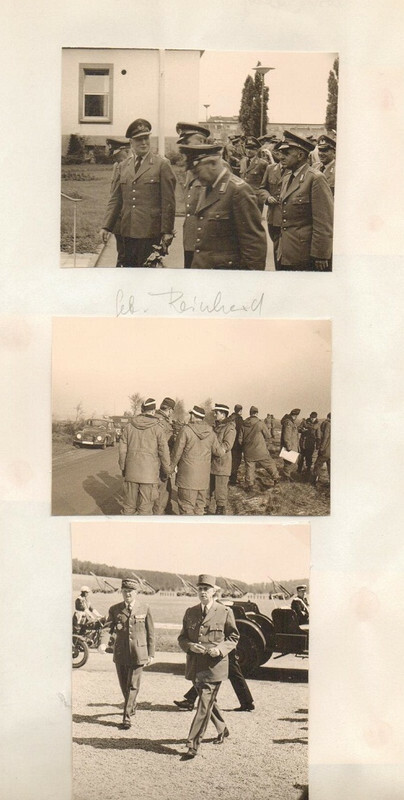 A letter received from Generalleutnant Wolf Graf von Baudissin, January 6th 1964. 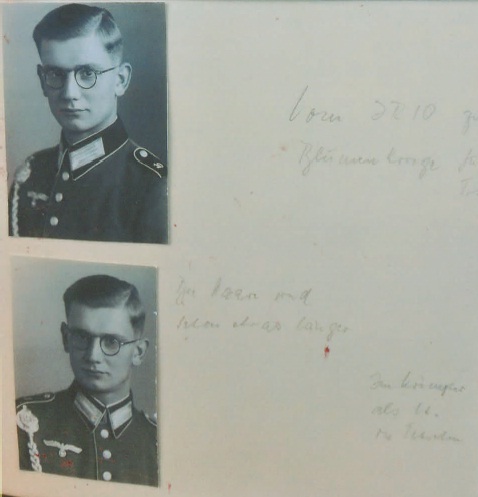 Graf von Baudissin also served in WWII, as a Hauptmann and taken prisoner in 1941. 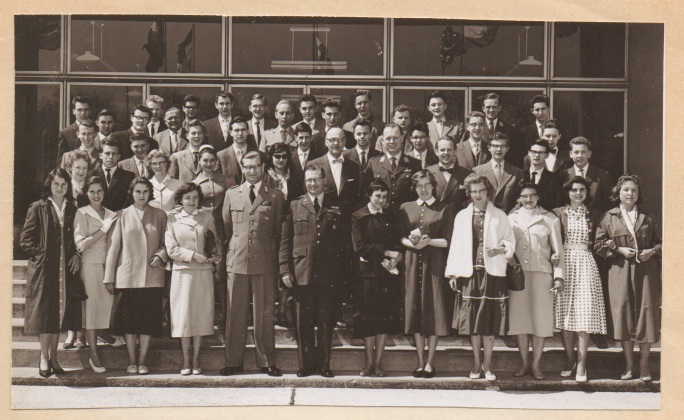 The PANDA Division 1957 (Manpower Branch of Personnel). In the middle the SACEUR, General Norsted. The photos above where taken at the doors of the SHAPE HQ, Fontainebleau, France. 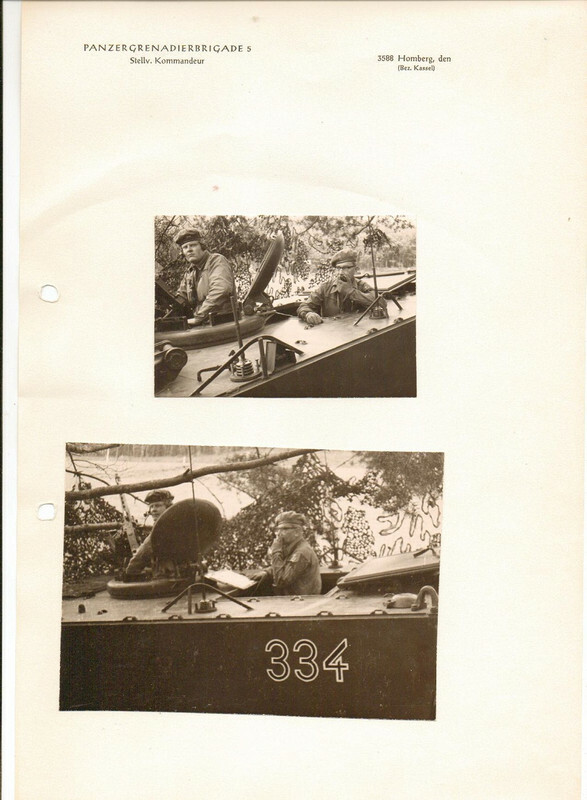 Two pictures taken during maneuvers with the Panzer Granadier Brigade 5. 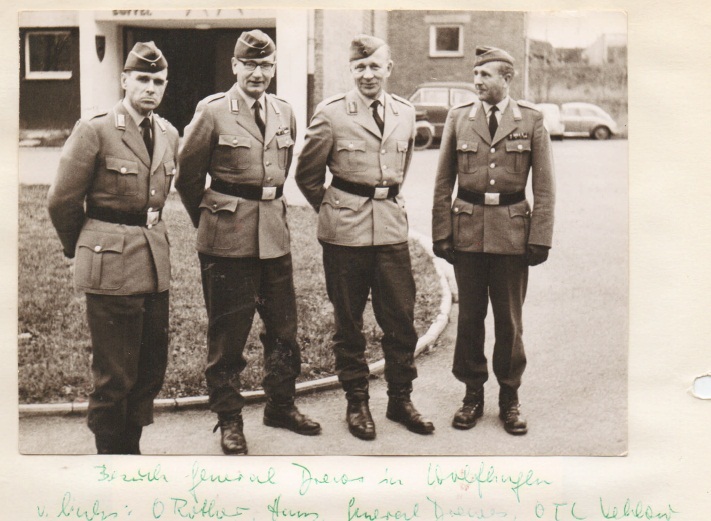 One of the last photos of Lt. Col. Hans Guhr, taken in 1965 with general Drews during an exercise in Wolfhagen, Hessen. 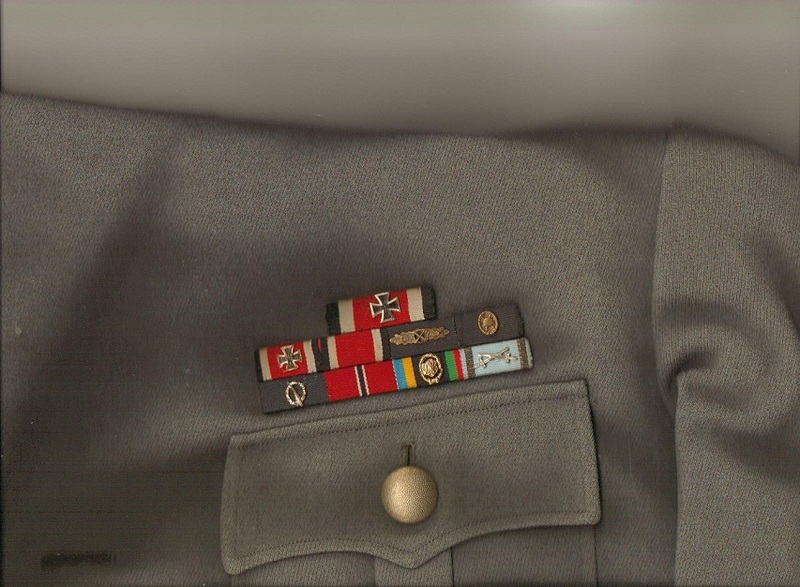 The jacked of Lt. Col. Guhr, with the awards he proudly earned during WWII. At the top, the ribbon of the Ritterkreuz. The 1957 edition of the RK, as worn by Hans Guhr, among other personal items. 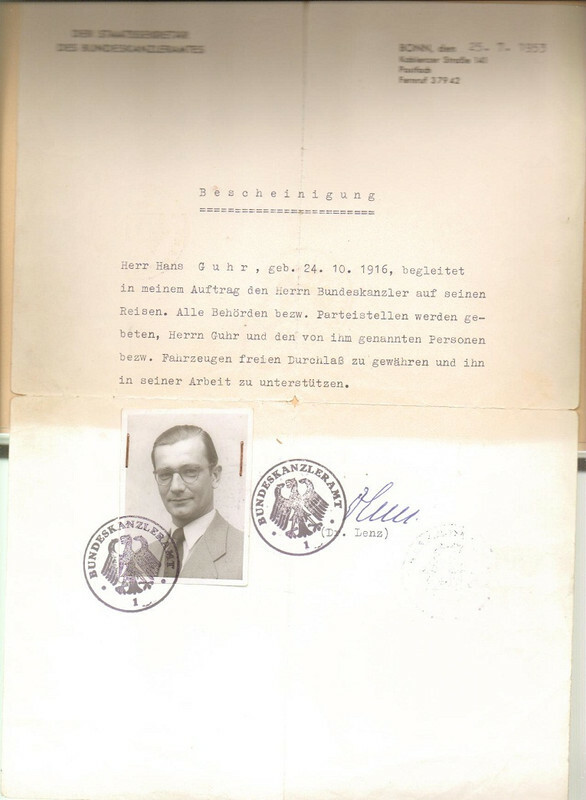 The RK awarded to Hans Guhr, as an Oberleutnant at the time, in 1942. 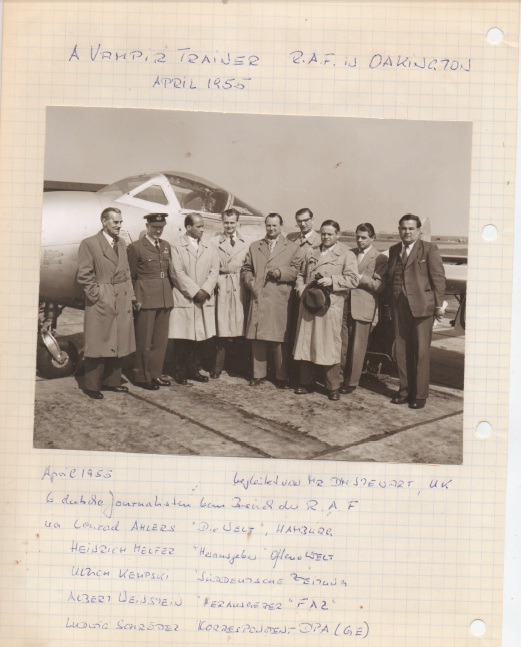 Lt. Col. Hans Herbert Guhr died on February 10th 1969, leaving behind a wonderful family; his son chose to follow his father’s steps in the Armed Forces of Germany, to defend flag and country. Michael Guhr served as a Panzergrenadier and reached the rank of LTC and commander of an anti tank battalion in the German army. He finished in 2006 in the same international staff, SHAPE/MONS, where his father started again his military career. 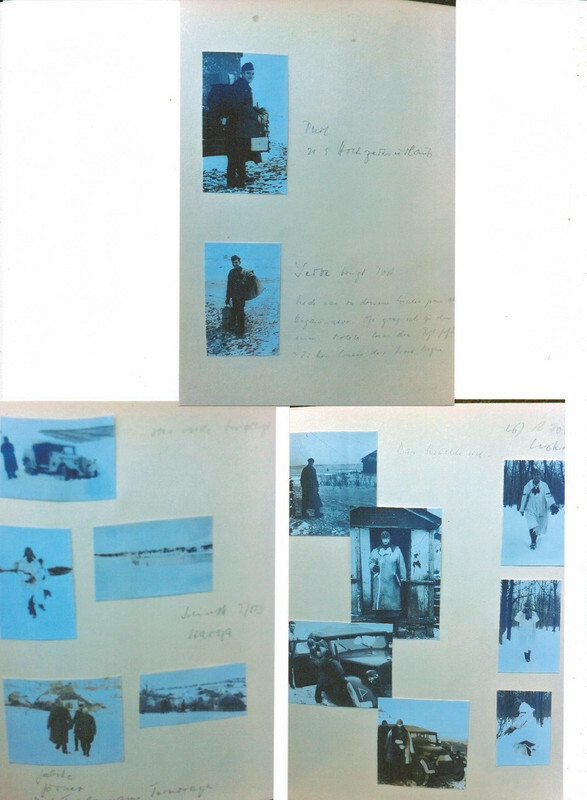 This work couldn’t have been possible without the rewarding help of Michael, who provided all the photos, history and stories of his father. We hope to be able to leave for the future a humble legacy of a great man, who fought many fronts in his life and always had Germany’s honour on his mind and heart. United by blood and profession: father 1942, 26 years old and son 1969, 21 years old. Agustín Vázquez, Santa Fe (Argentina). 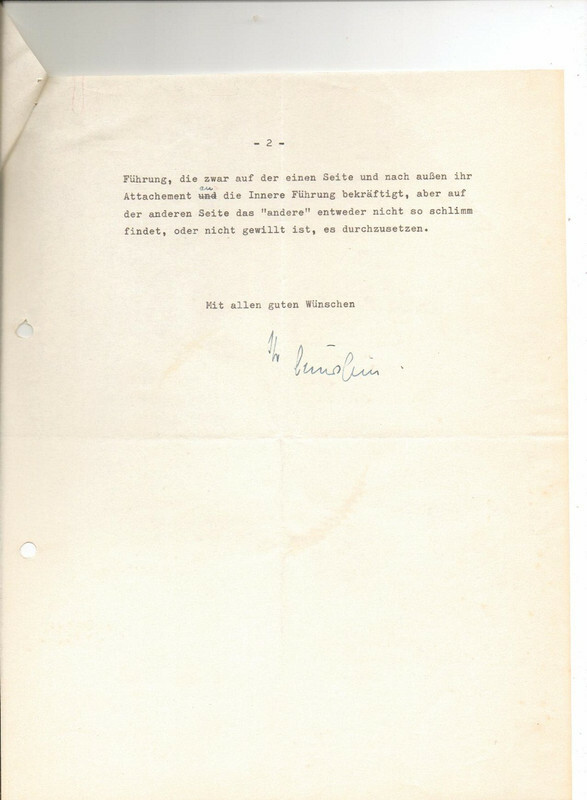 He wrote his desire was to become an officer in the Reichsheer, the term for the army during the Weimar Republic, but not the Imperial army as this no longer existed after World War One. Incredible! Thanks for sharing this complete, amazing Nachlass ! Thanks Houwe! Indeed an amazing amount of information of one soldier! Sepp that was great to read. Thanks for doing all this hard work, and thanks to the family for the information they shared. Great stuff. 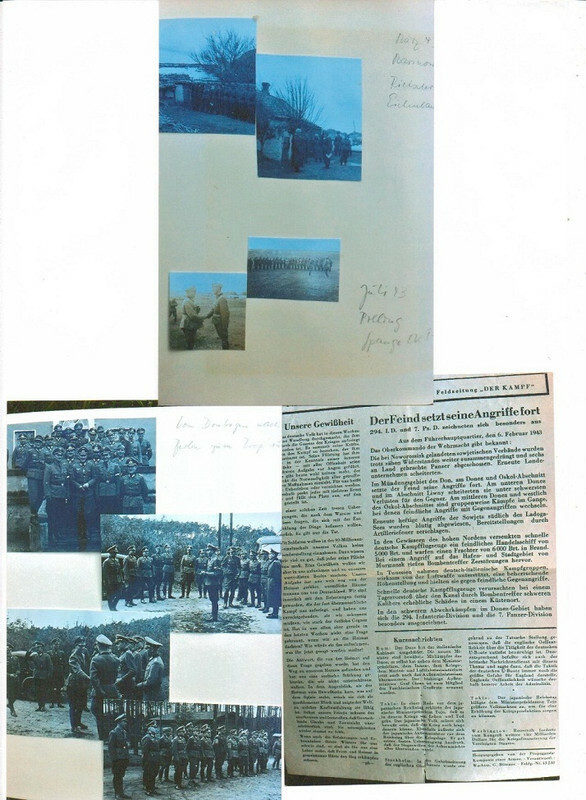 "son chose to follow his father’s steps in the Armed Forces of Germany, to defend flag and country." yes.lets hope not the old flag. He's second from the right (second row). Glad you enjoyed it Dave! Excellent eye Tony , yes, it's Major Guhr indeed! Thanks!